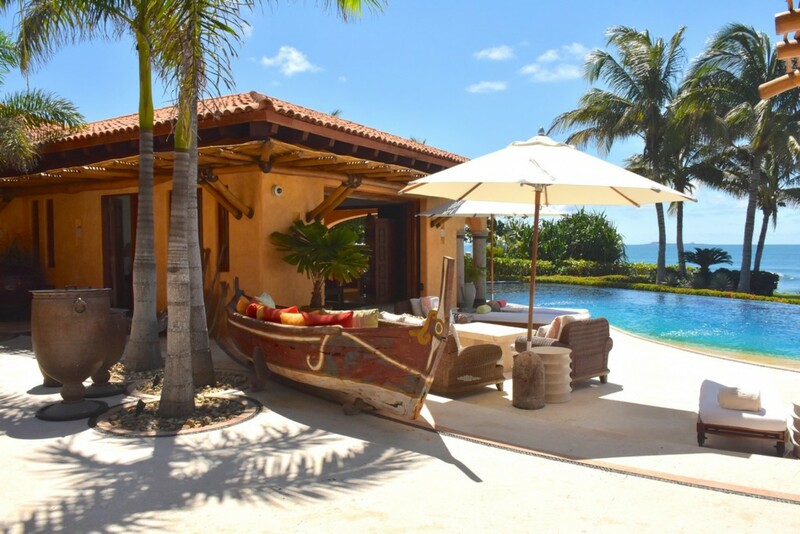 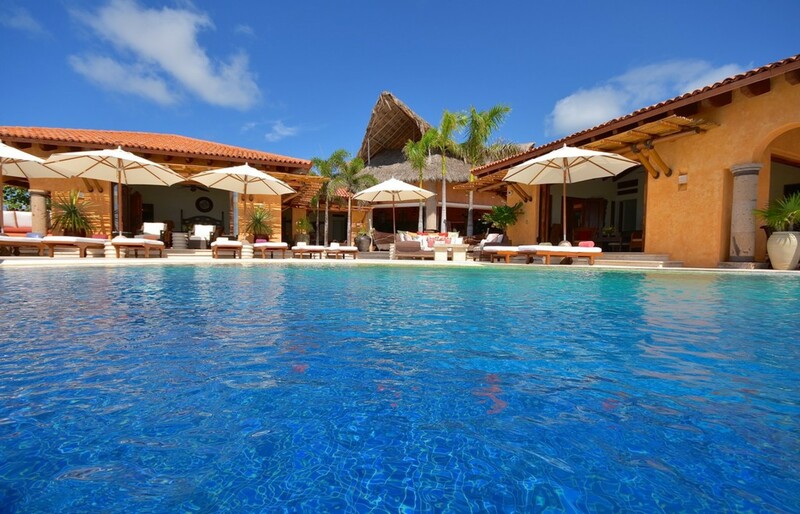 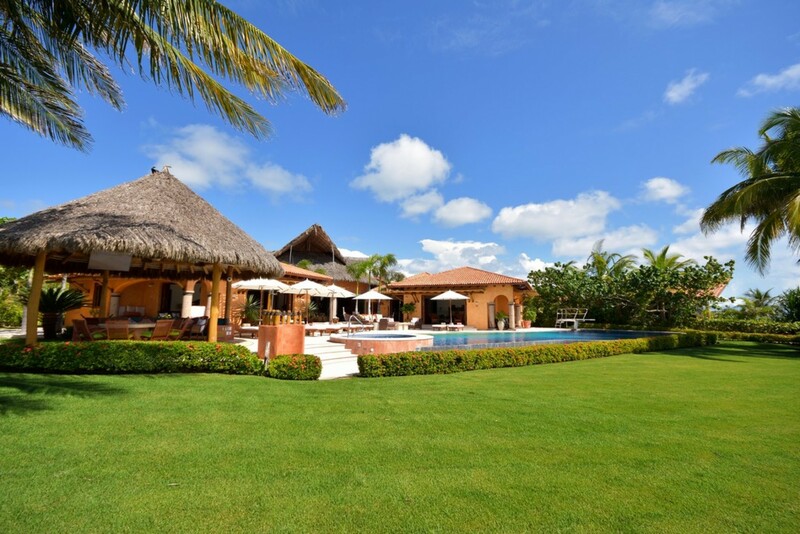 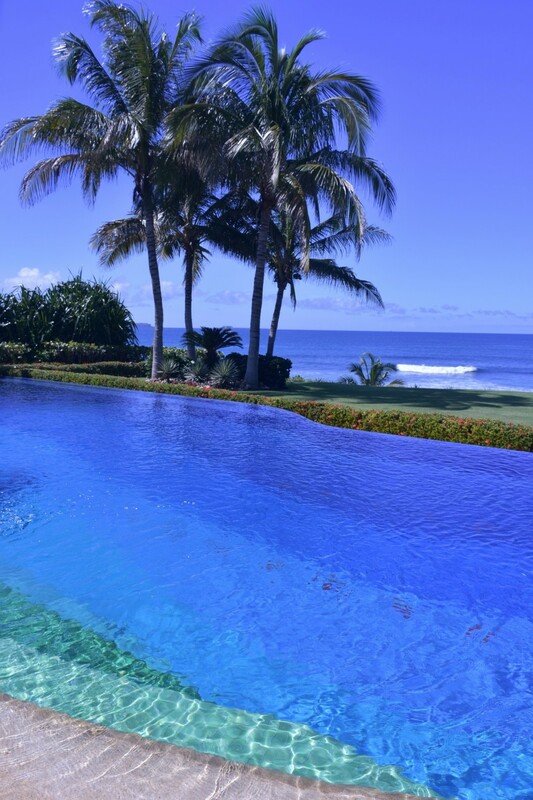 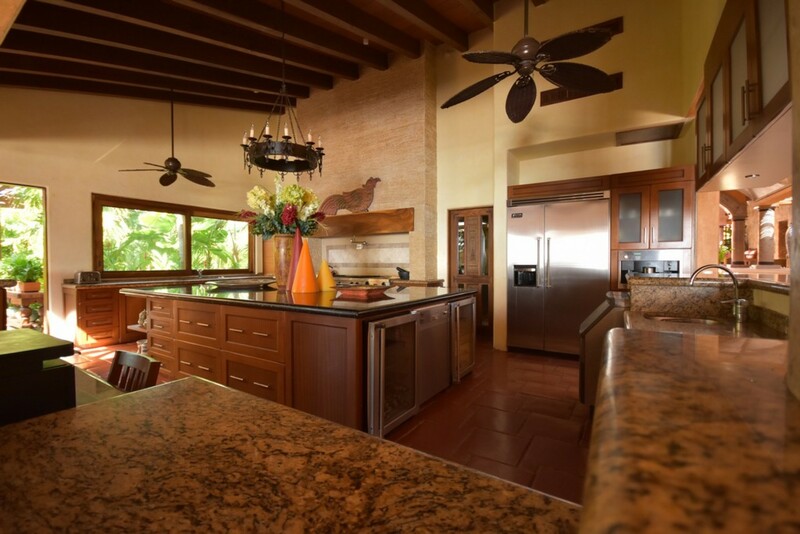 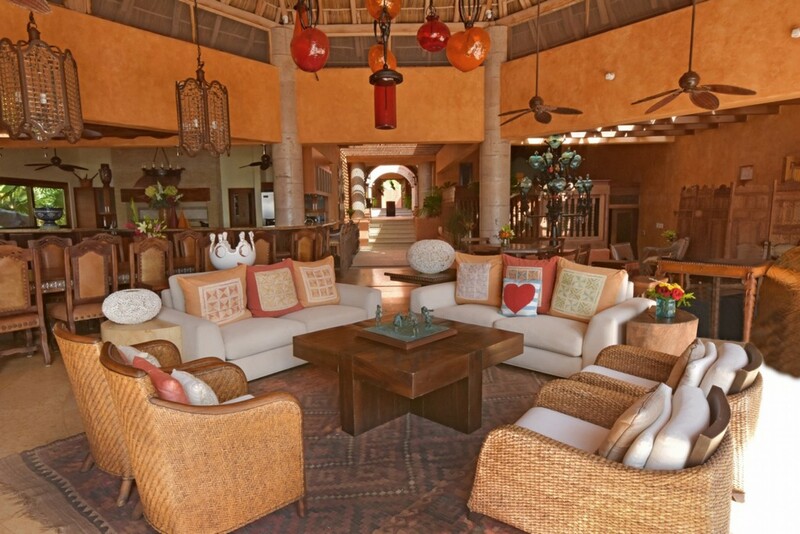 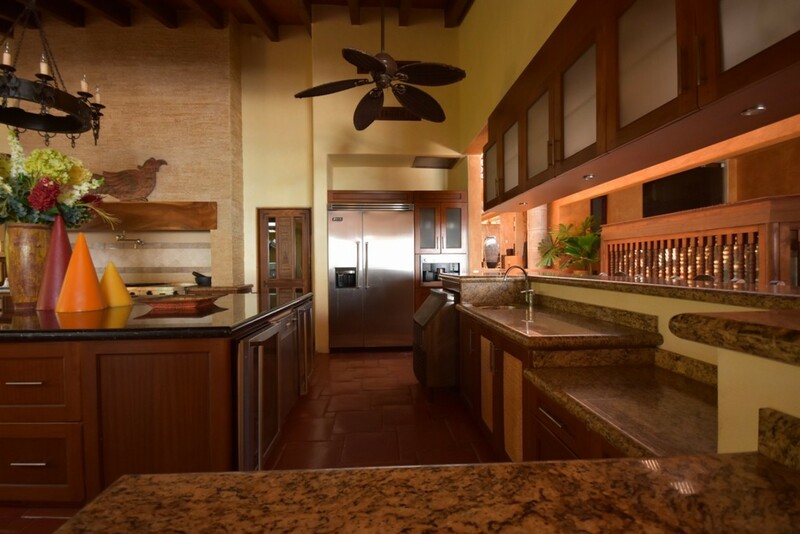 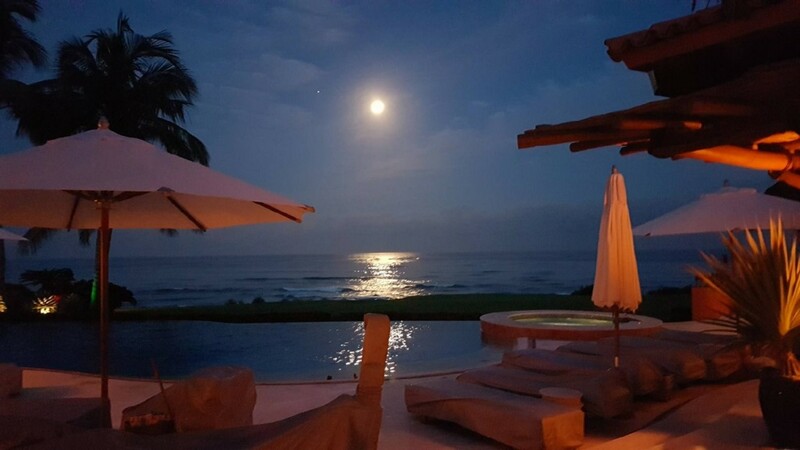 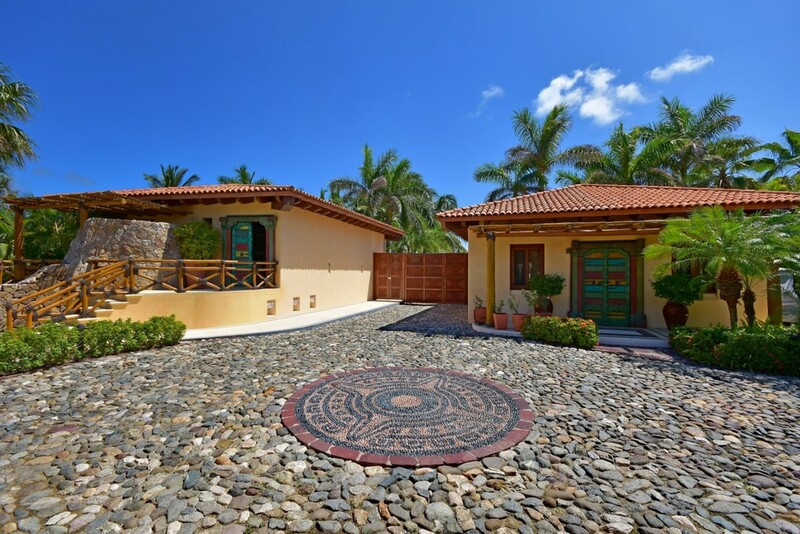 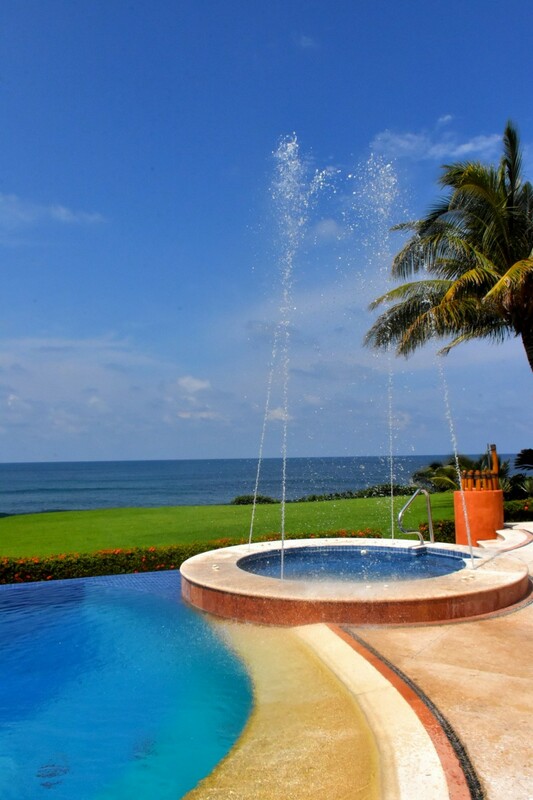 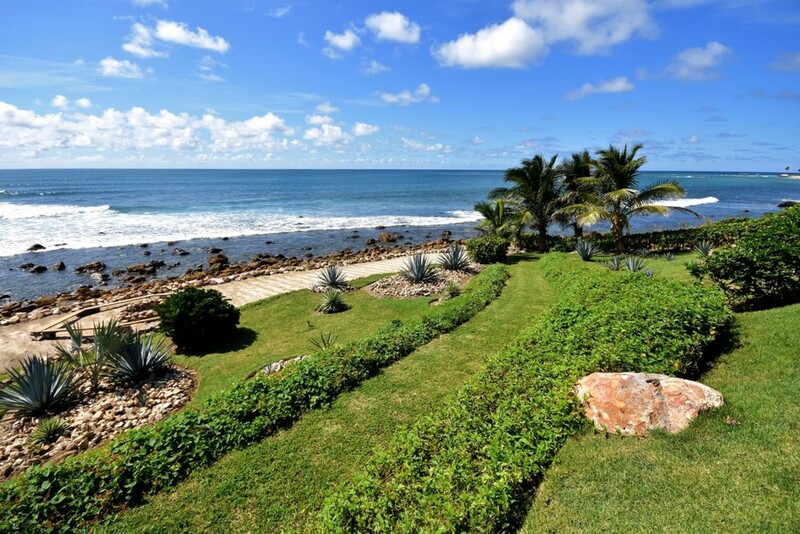 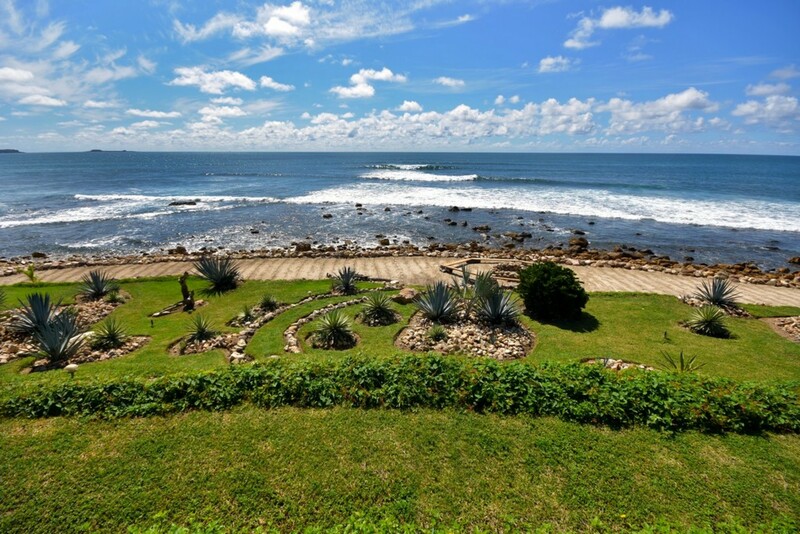 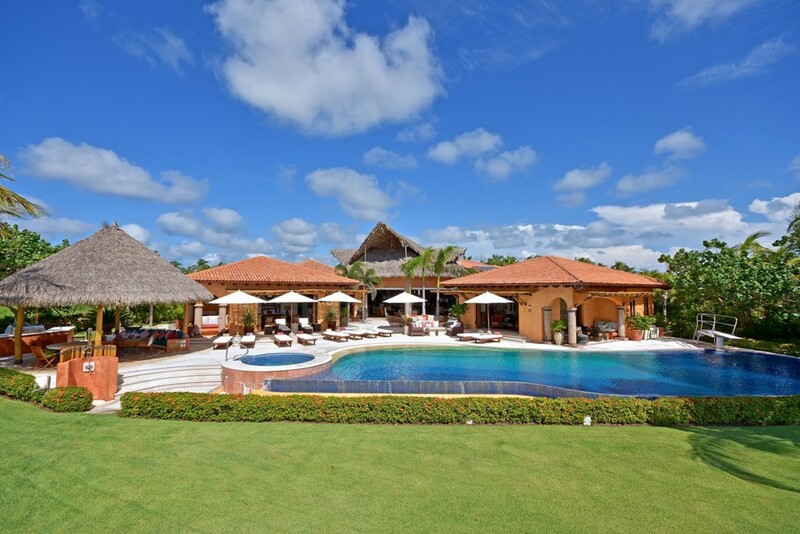 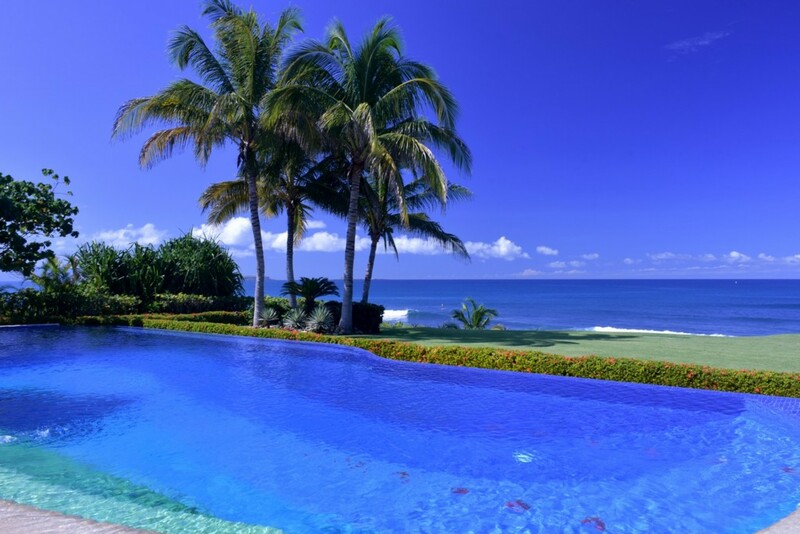 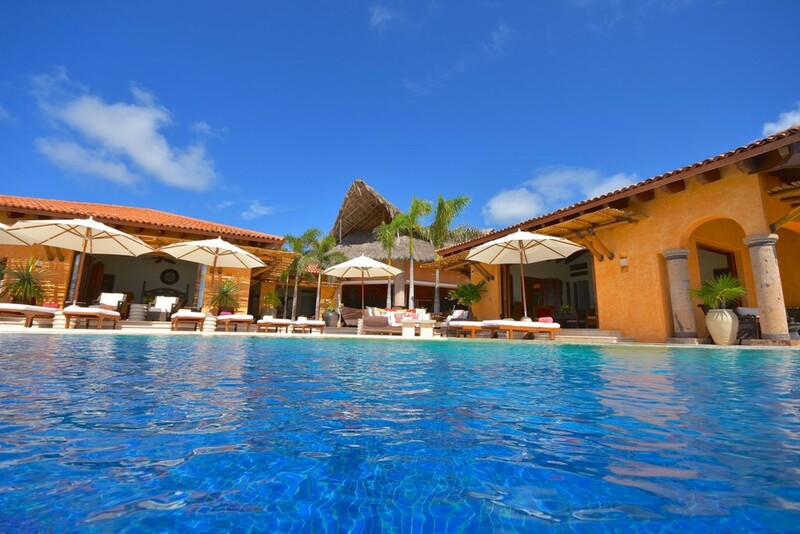 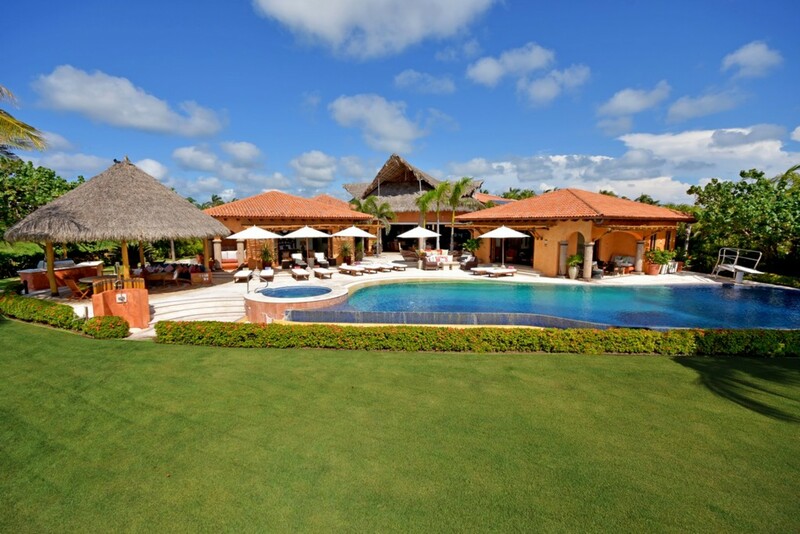 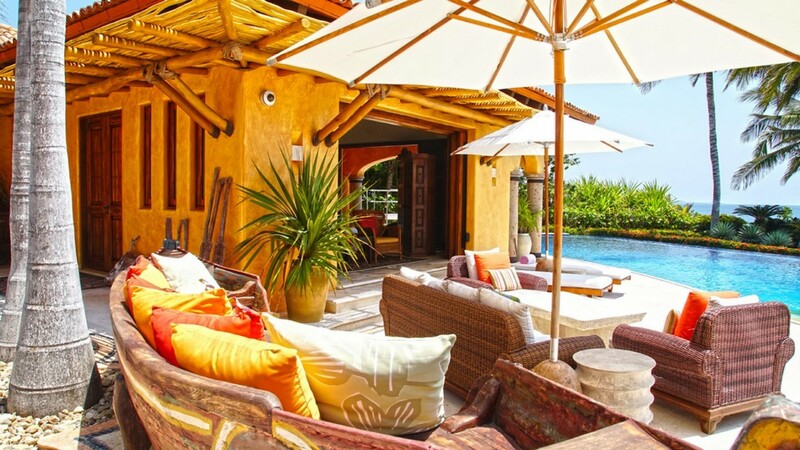 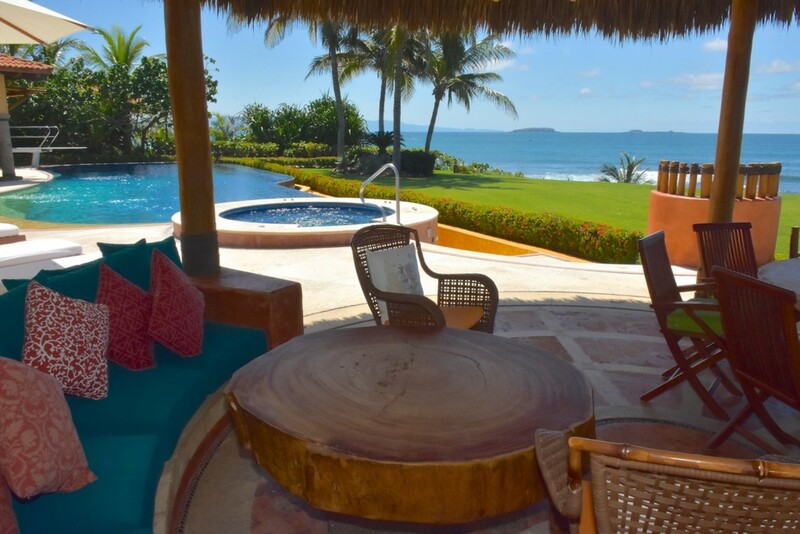 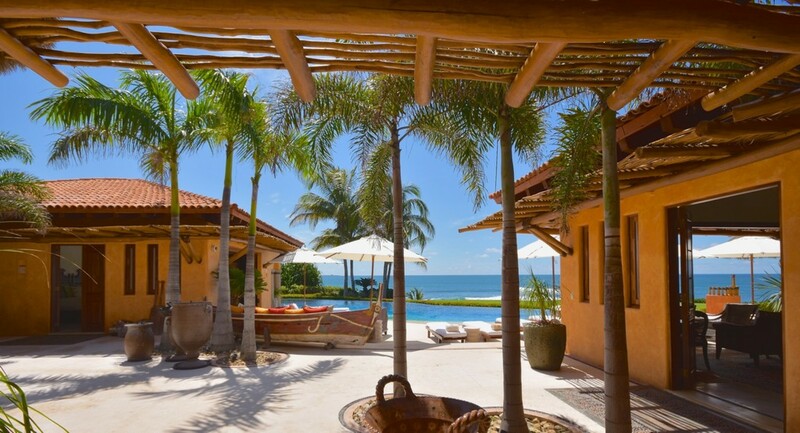 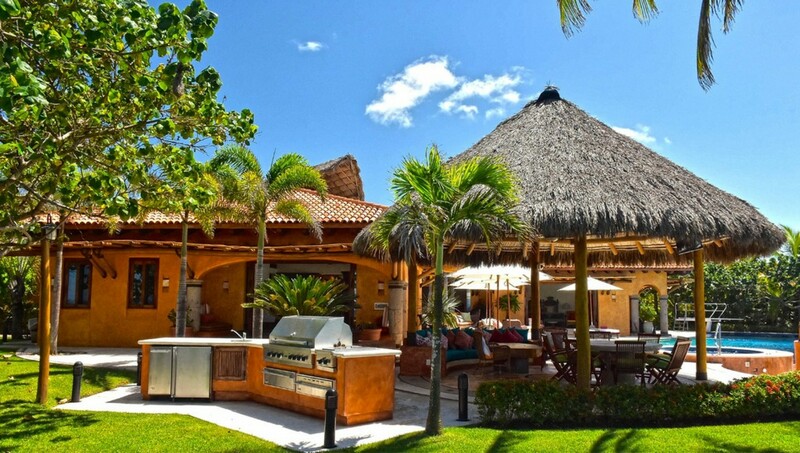 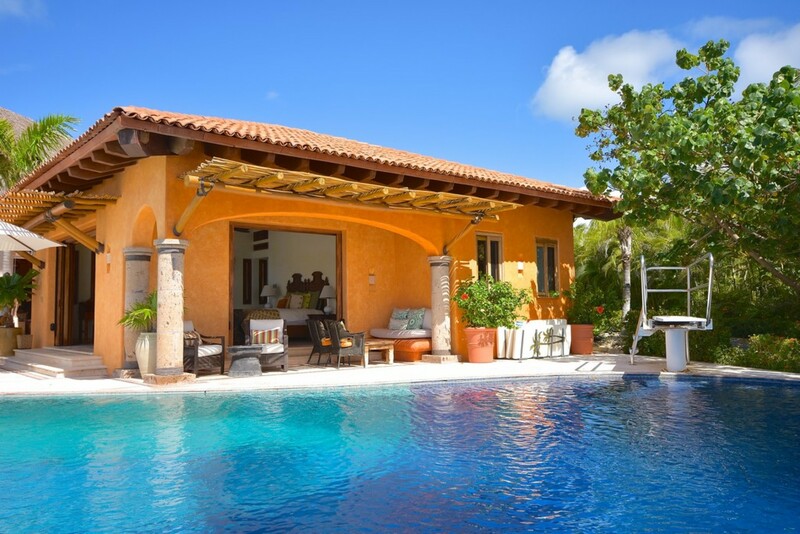 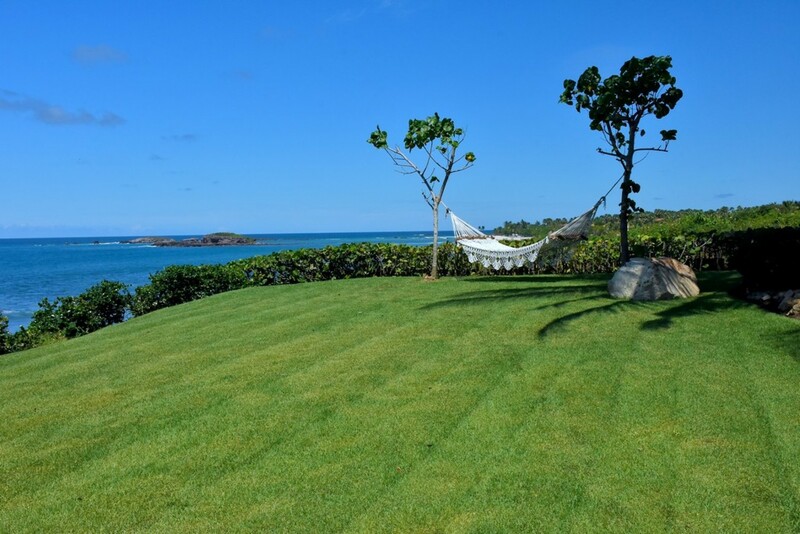 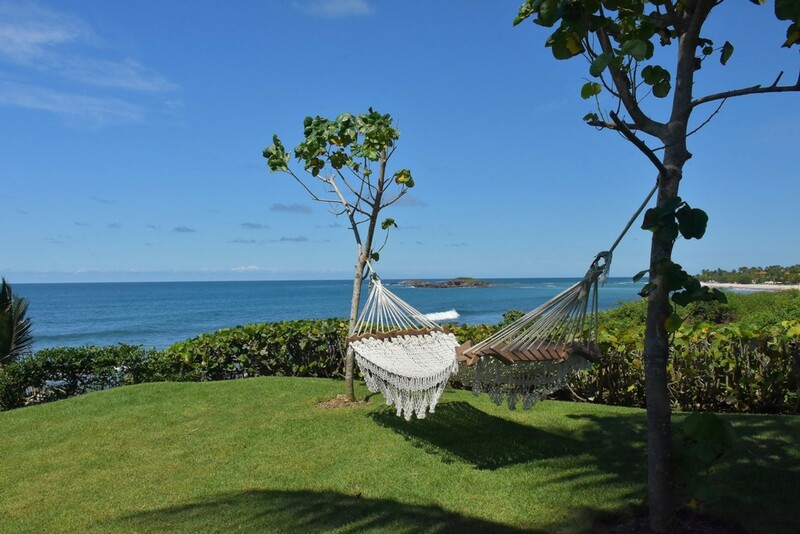 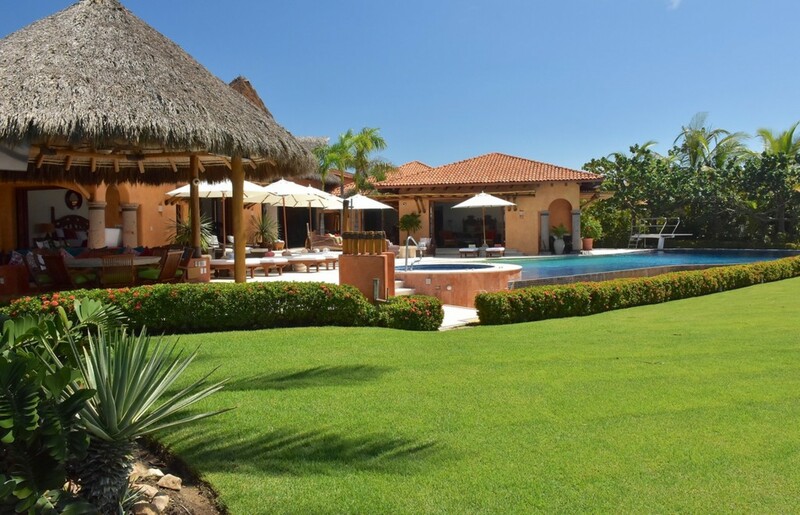 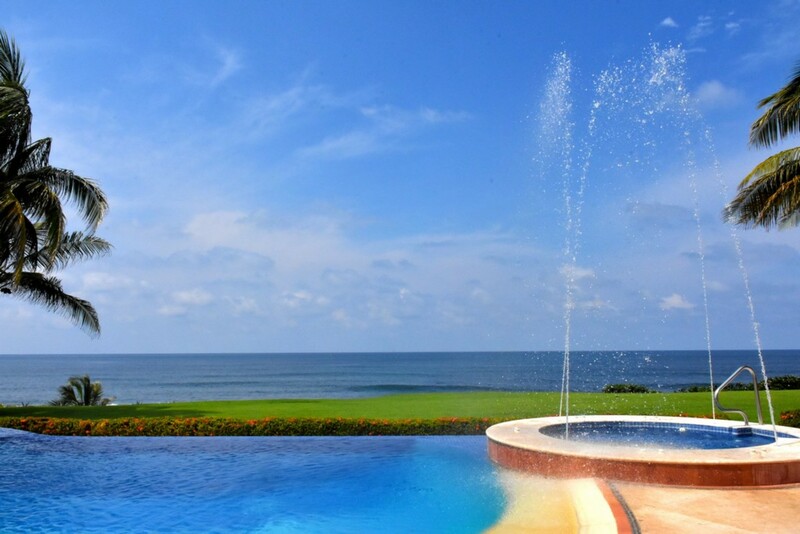 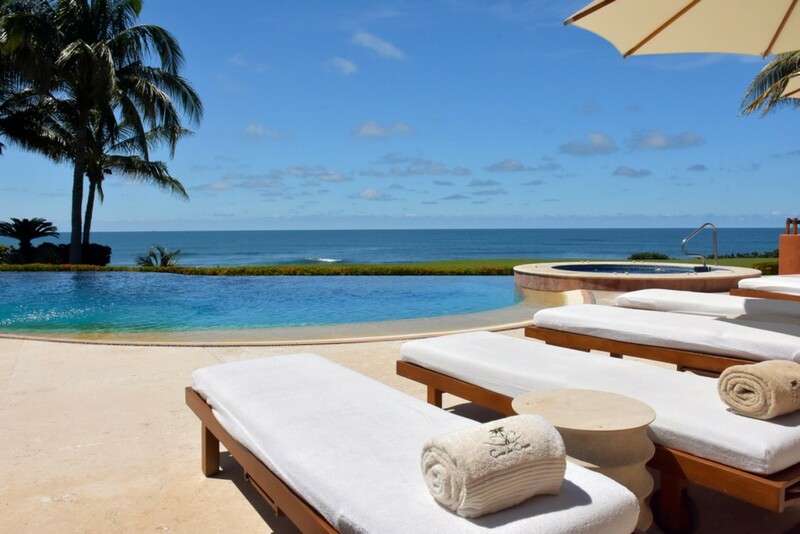 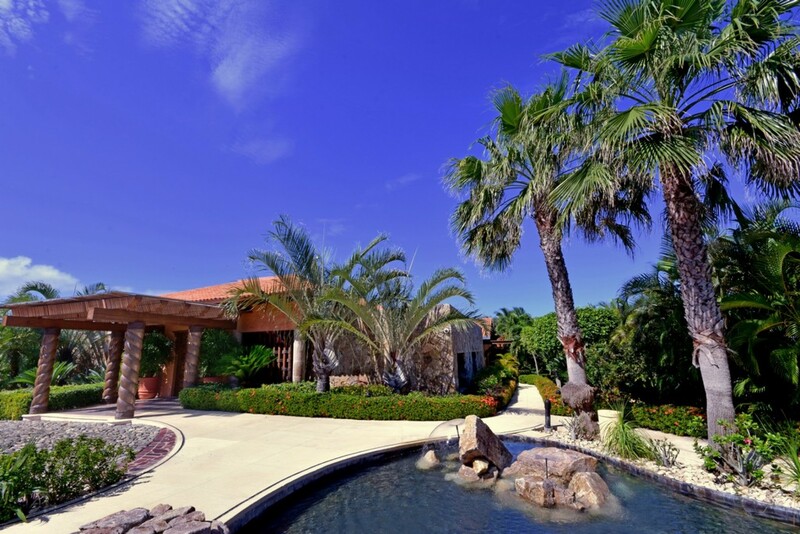 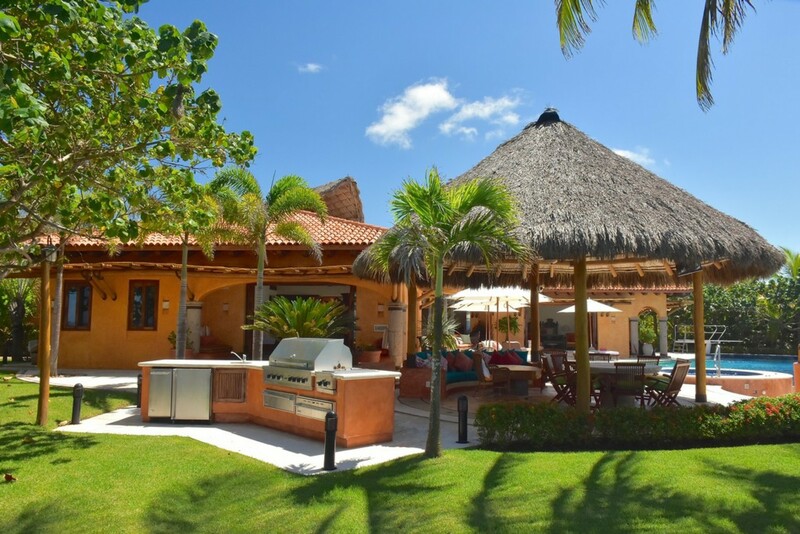 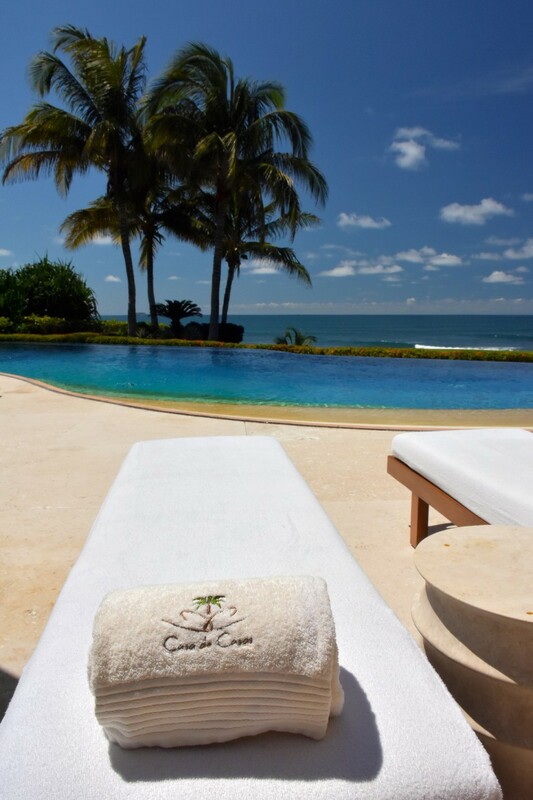 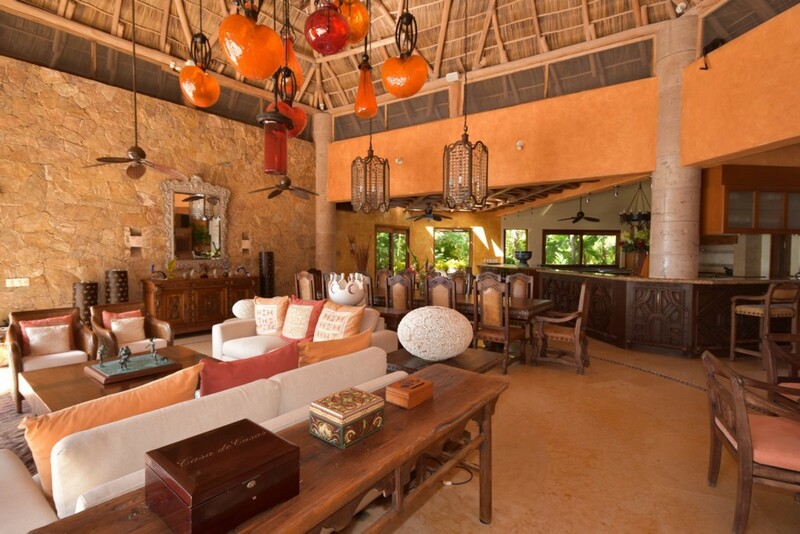 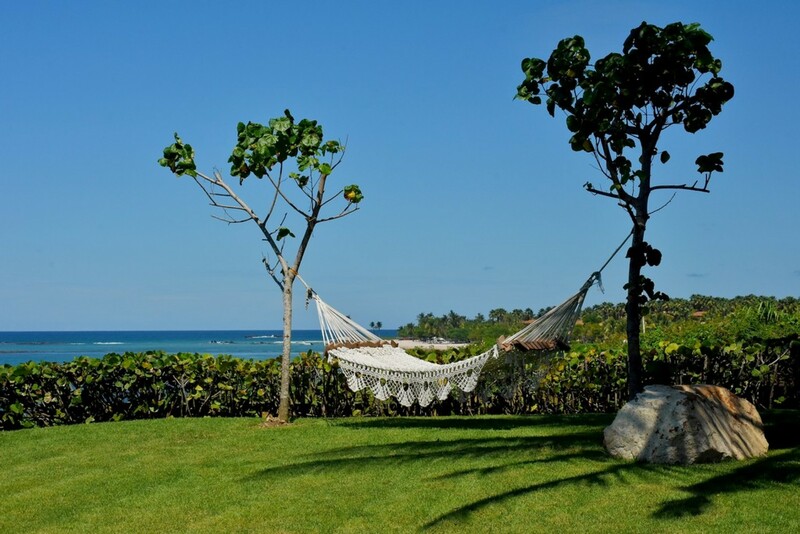 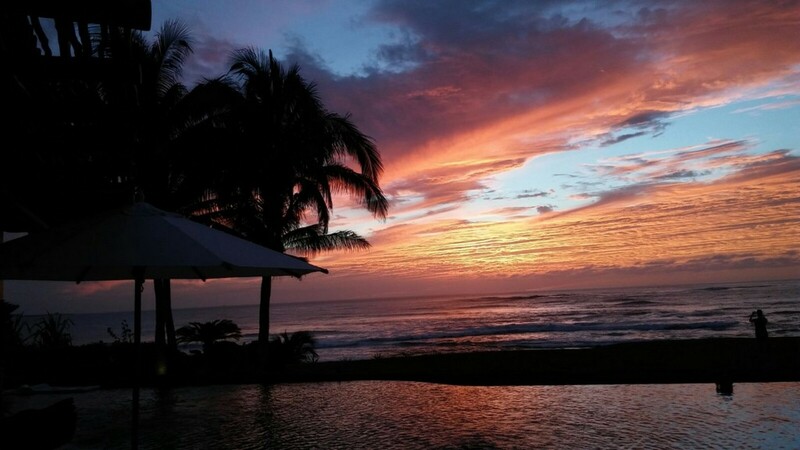 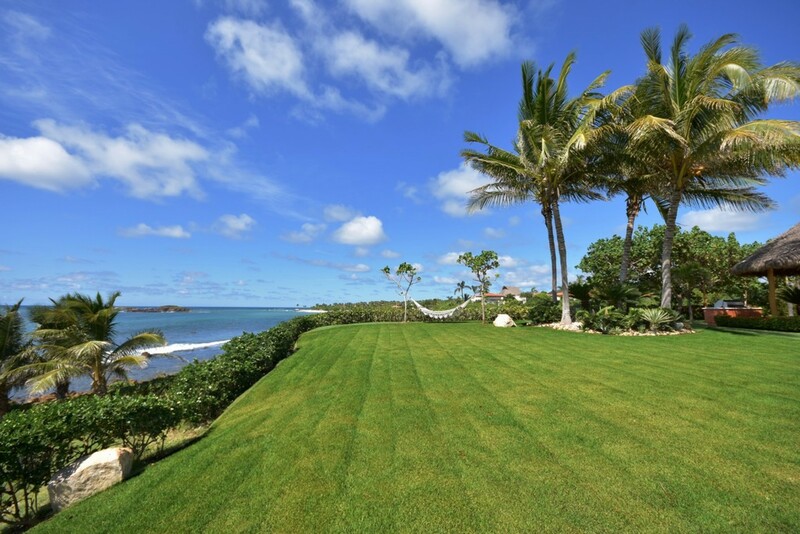 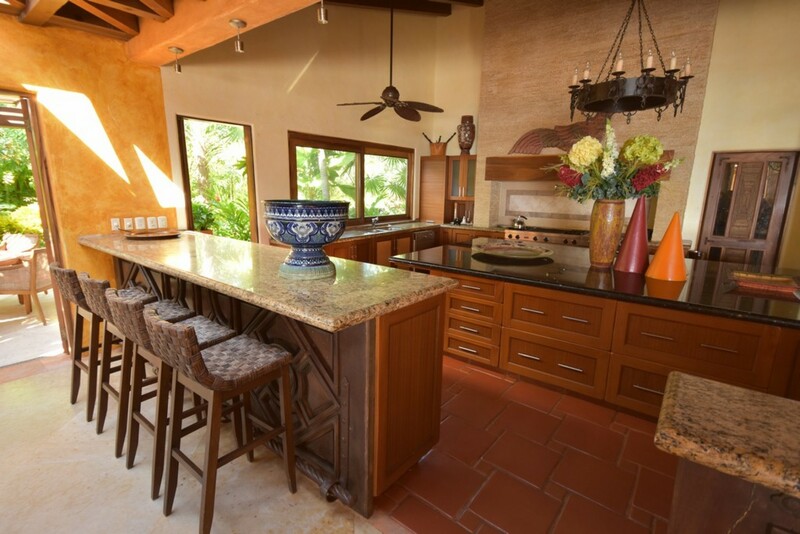 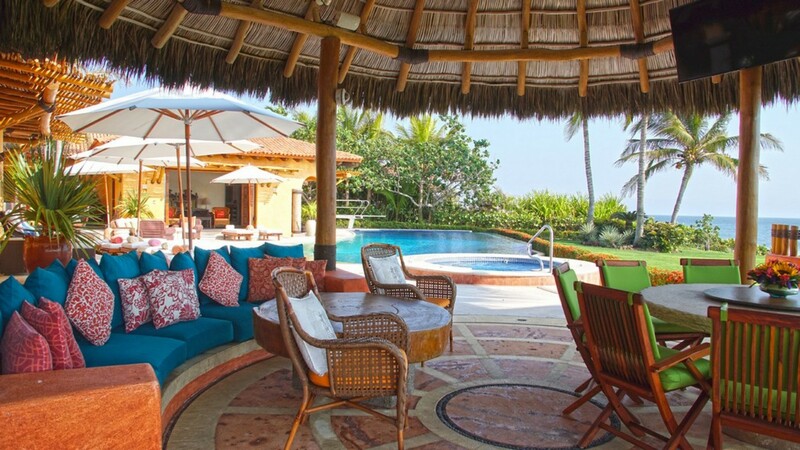 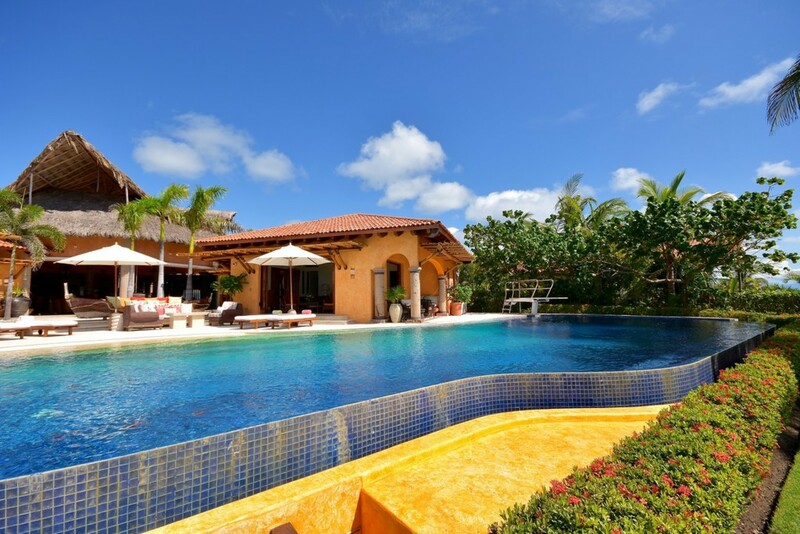 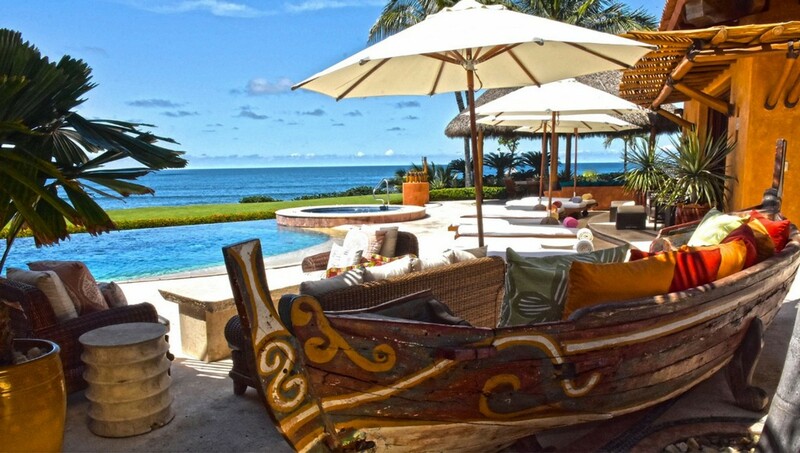 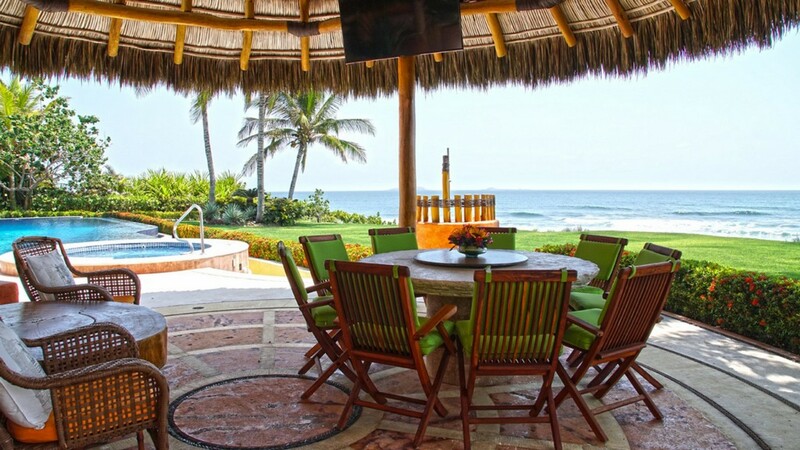 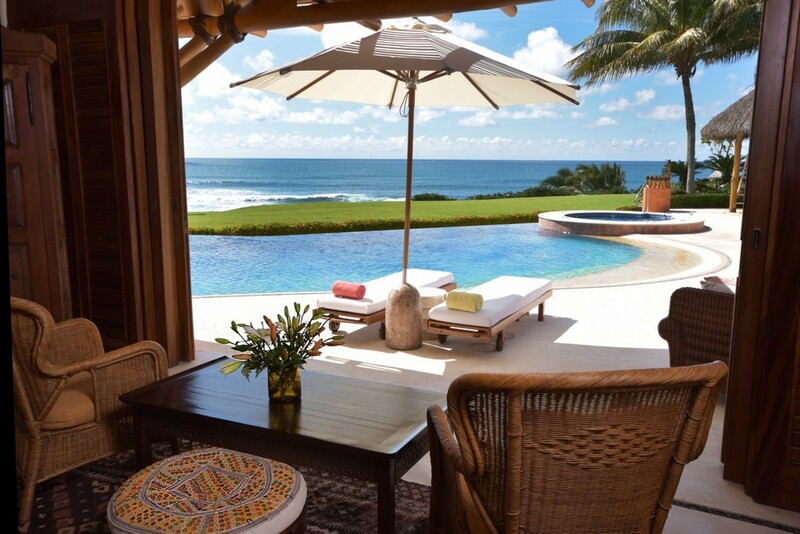 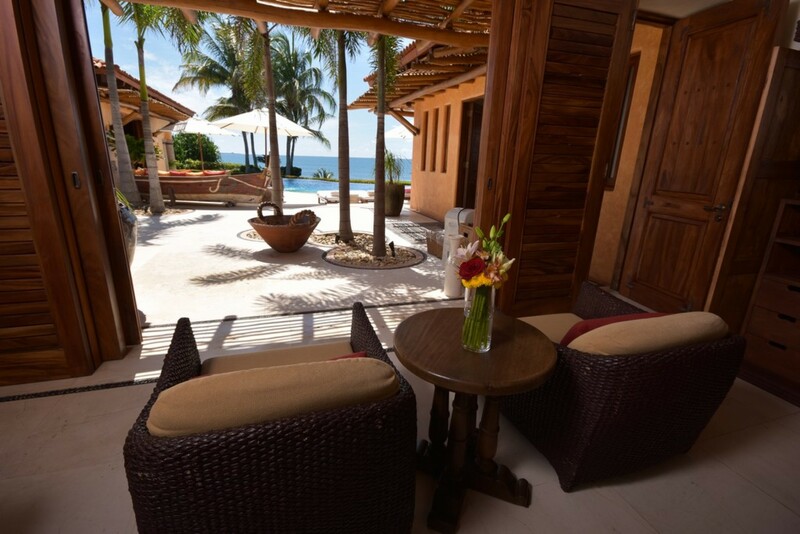 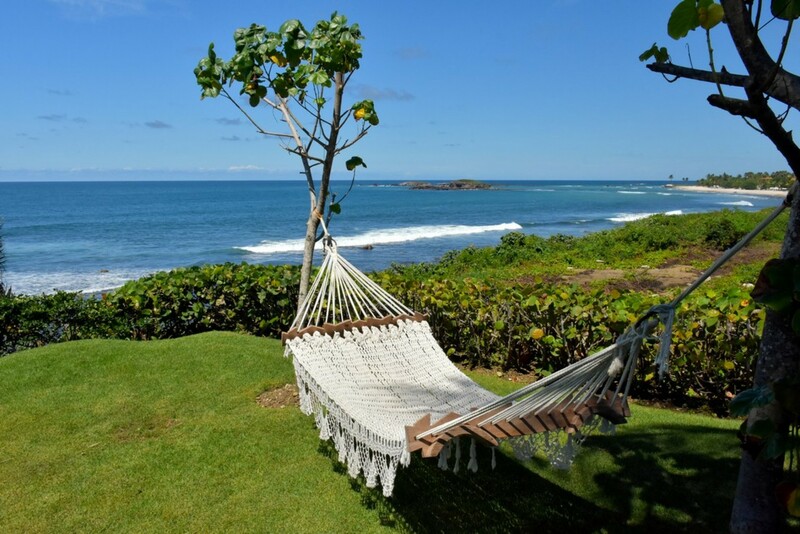 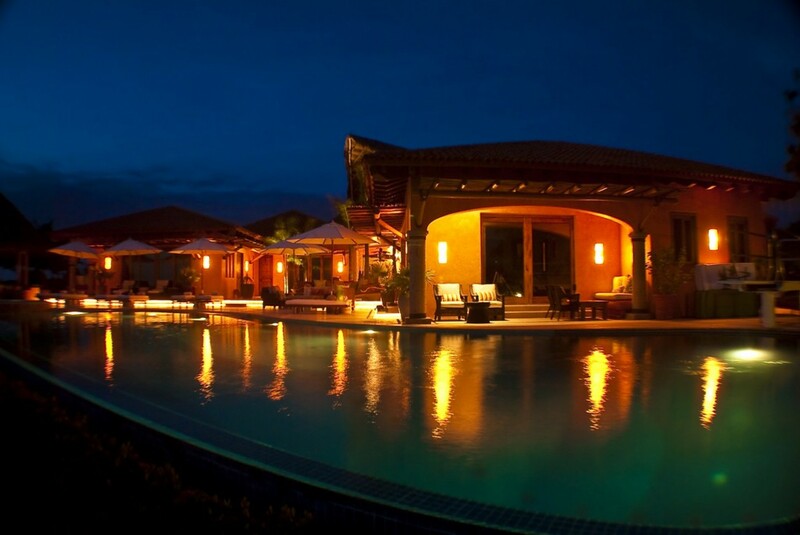 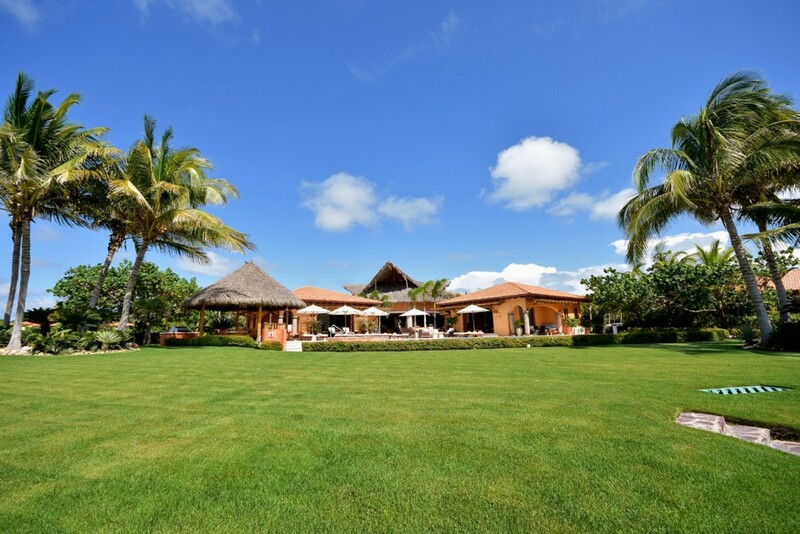 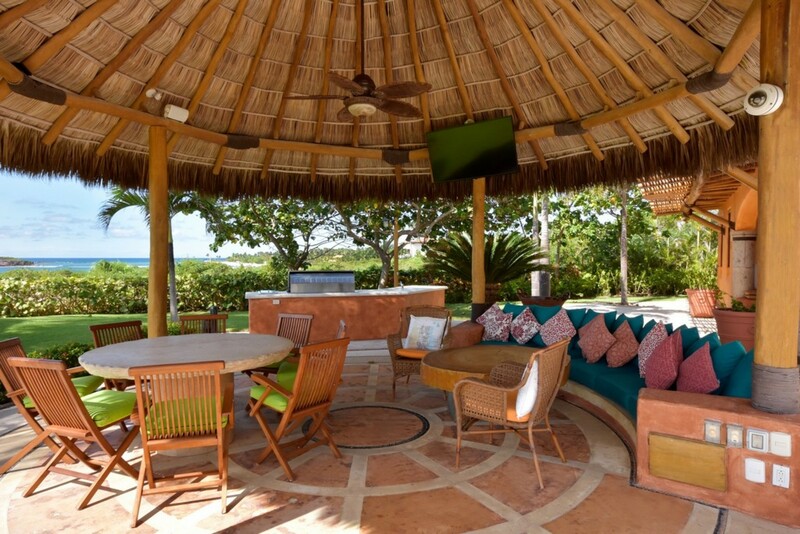 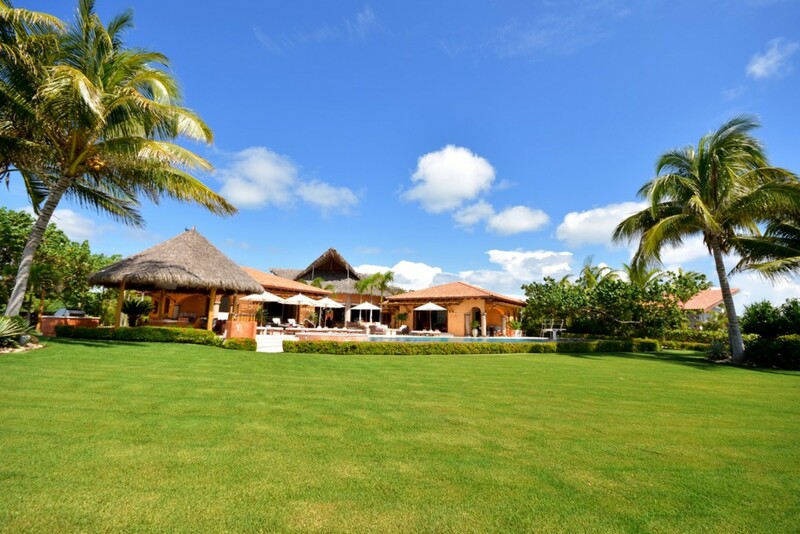 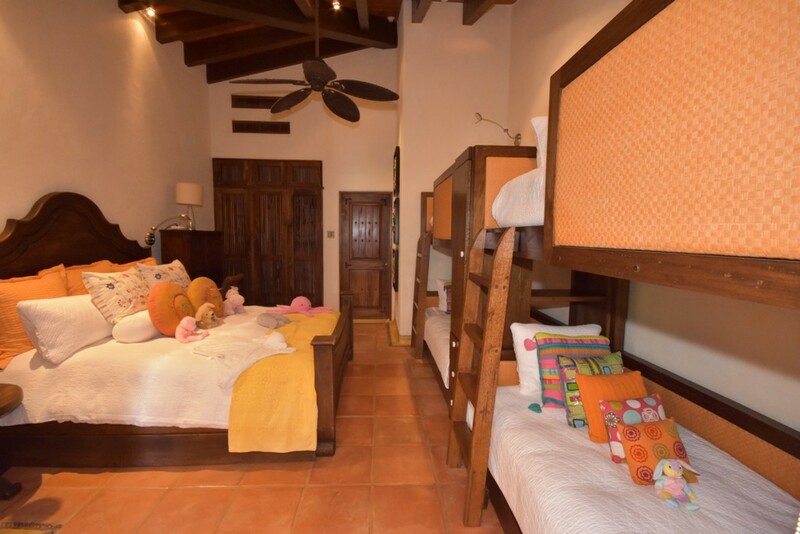 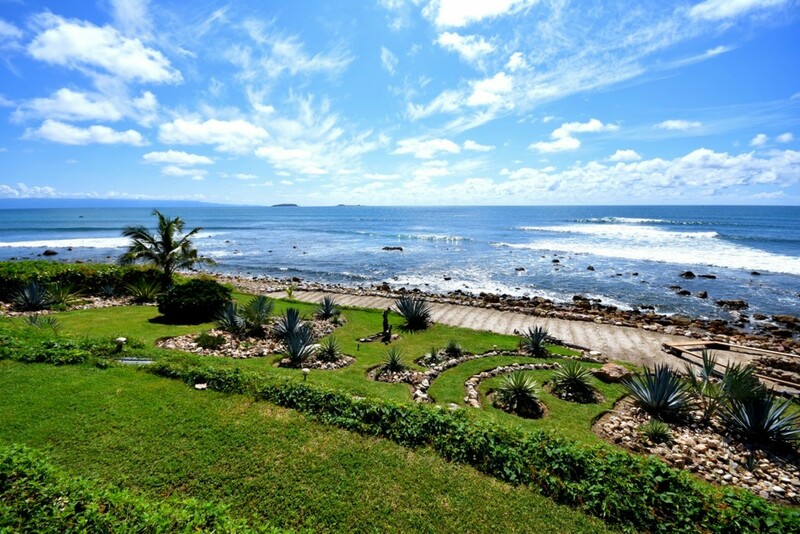 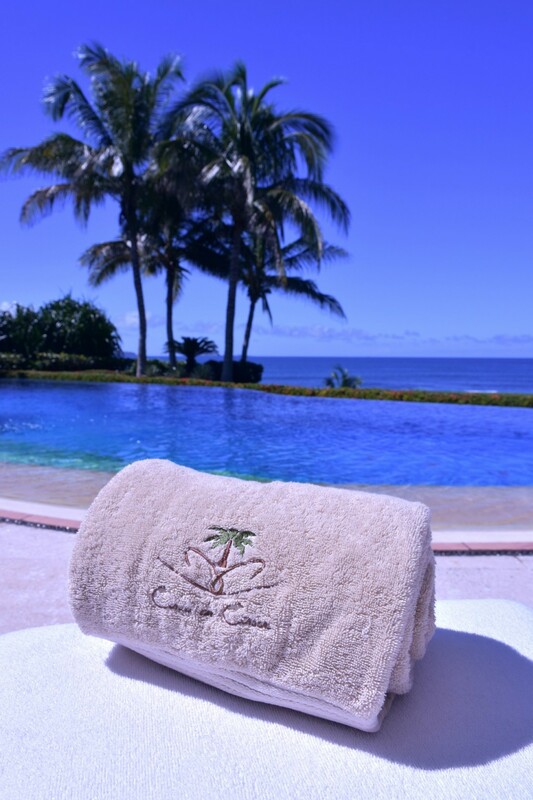 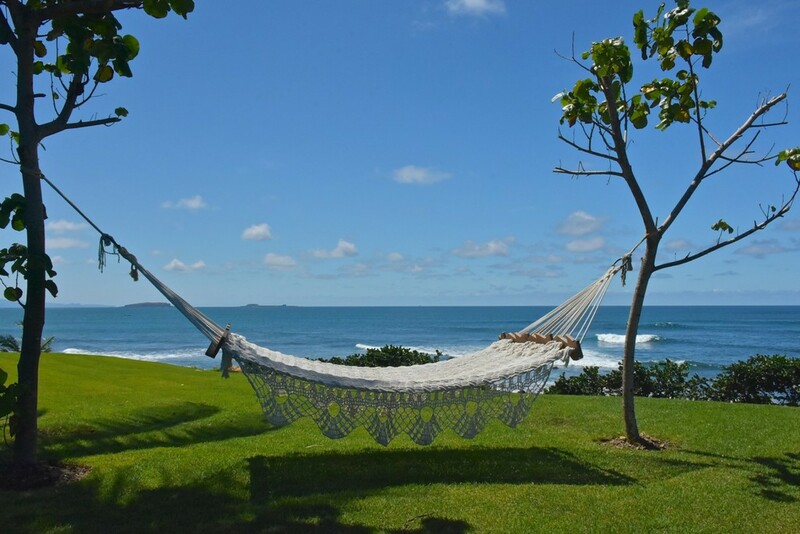 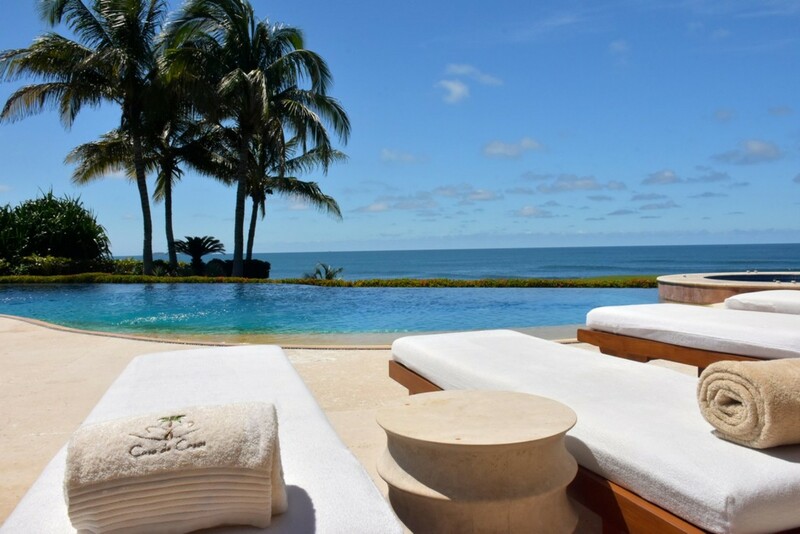 Welcome to Casa de Casas, an exquisite 7-bedroom villa in the beautiful fishing village of Punta Mita, located on a small spearhead peninsula in the Nayarit Region of Mexico, overlooking the Pacific Ocean. 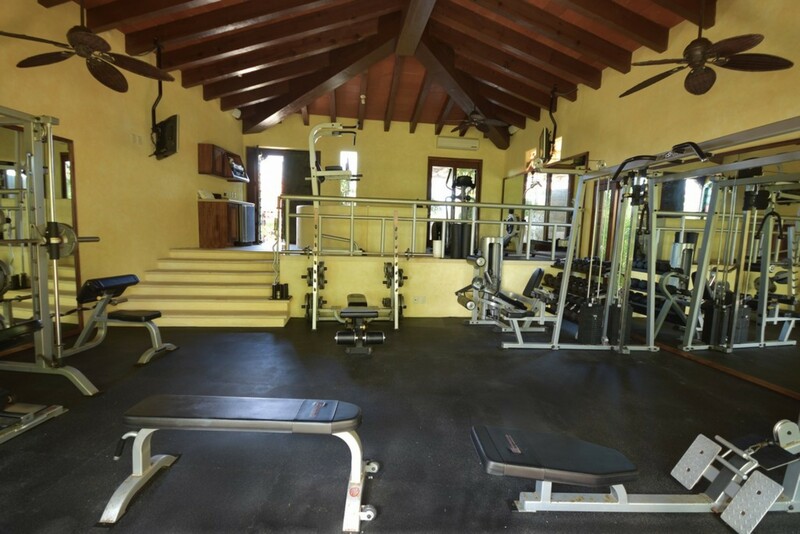 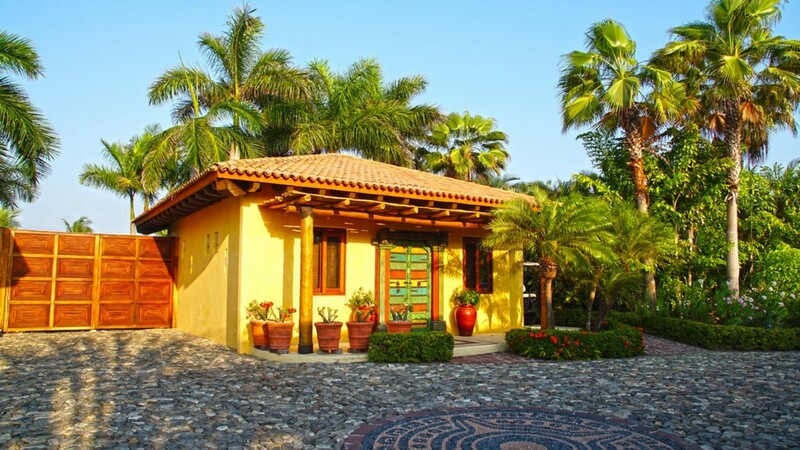 The architecture of Casa de Casas, boasting beautiful stone masonry and master carpentry, harks back to the influences of Old-World Spanish styles, with incredible attention to detail; red tile and pergolas form the rooves of the villa, all supported by Colonial-Spanish style pillars and arches, and a cobblestone driveway that wraps around the villa, framed by lush, landscaped garden. 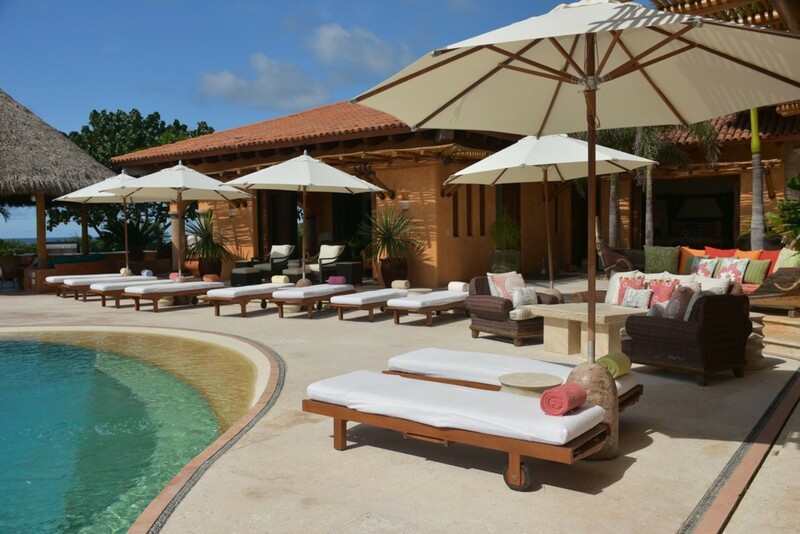 To the rear of the property, a private infinity-edge pool with heating options awaits guests, enclosed by a stone terrace that is populated with sun loungers, parasols and all manner of seating arrangements, either shaded or exposed to the sun’s rays, catering to all manner of guests who wish to enjoy the outer features of the villa. 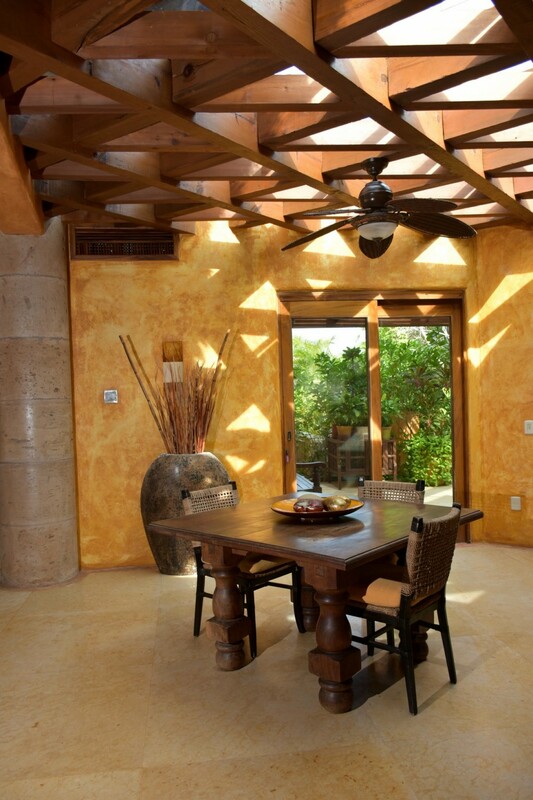 Dinner al fresco is a must for those who enjoy eating outdoors, and the Casa accommodates; a Viking grill and outdoor stovetop are available for use, and with the services of the private chef, the effort of preparing is removed; all that remains is to enjoy and marvel at the taste sensation under the shaded pergola, as the evening sunset becomes the backdrop to a magnificent dinner. 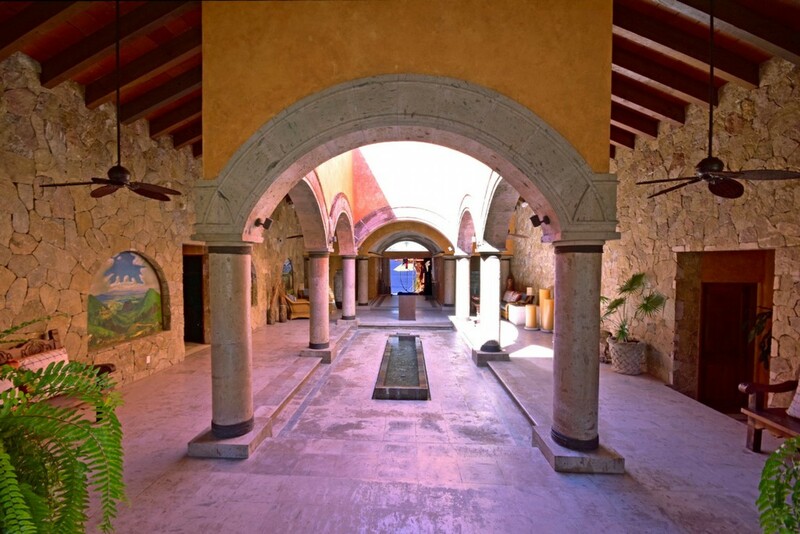 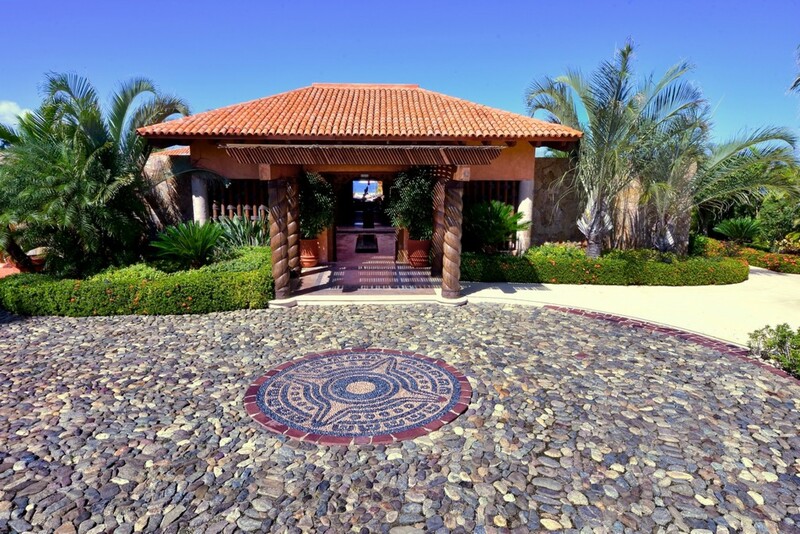 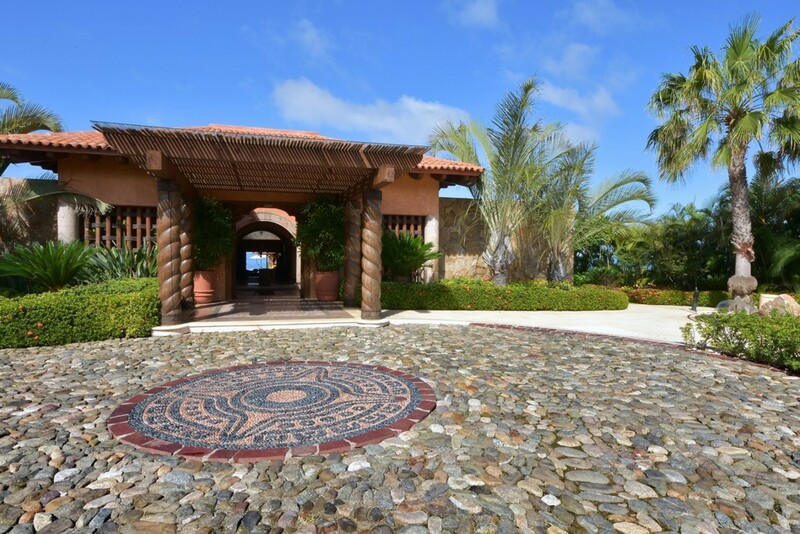 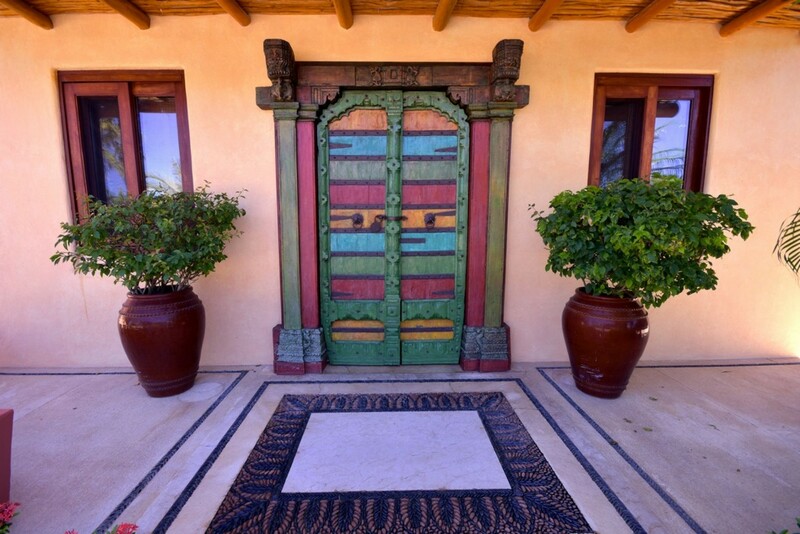 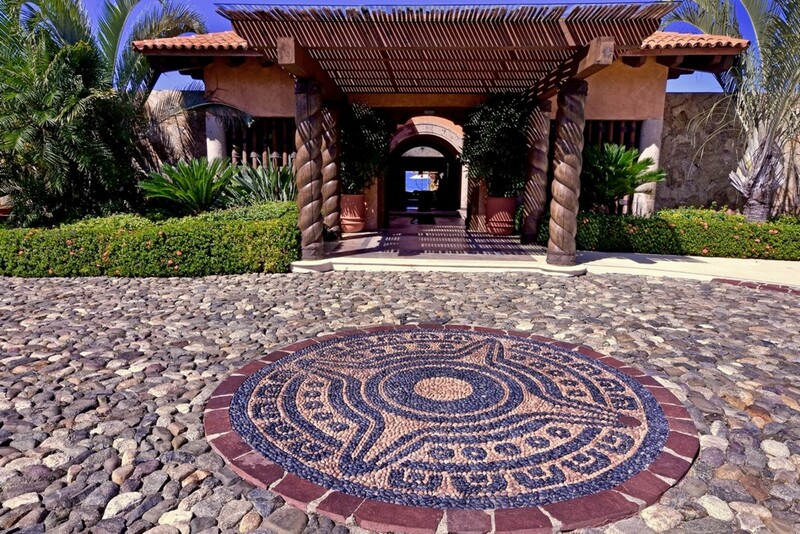 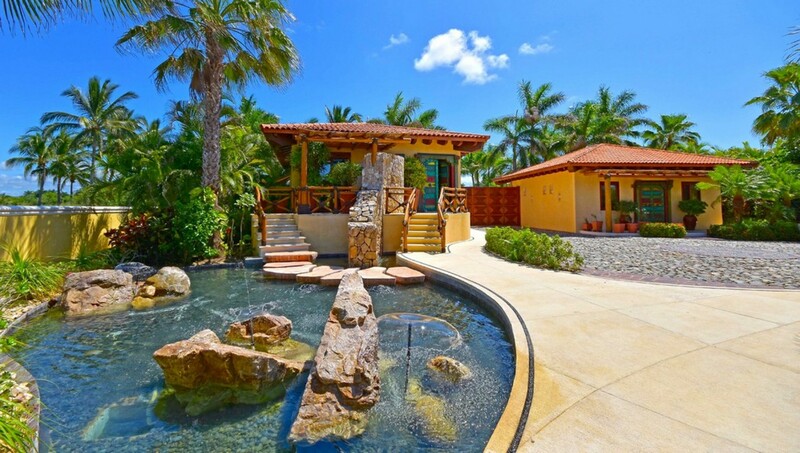 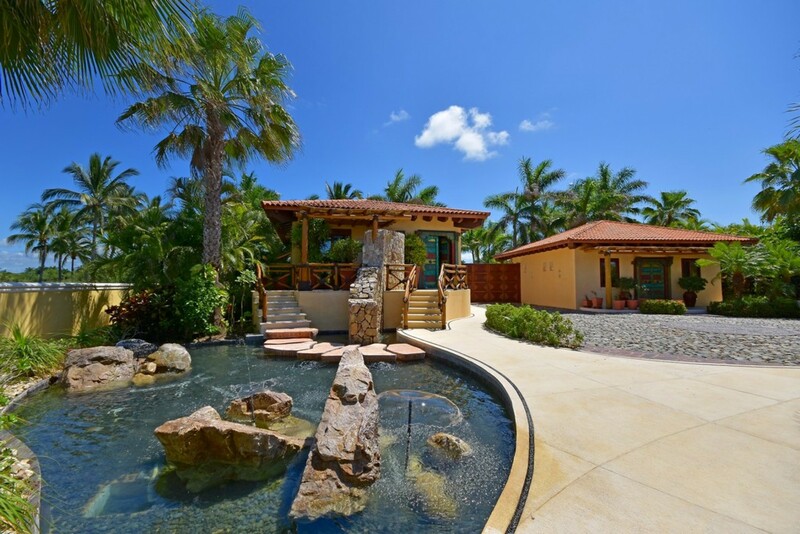 The front entry welcomes guests with warm, rustic colours, and passing under the pergola, through the front archway of the villa, the brilliant blue waters of the Pacific Ocean are visible. 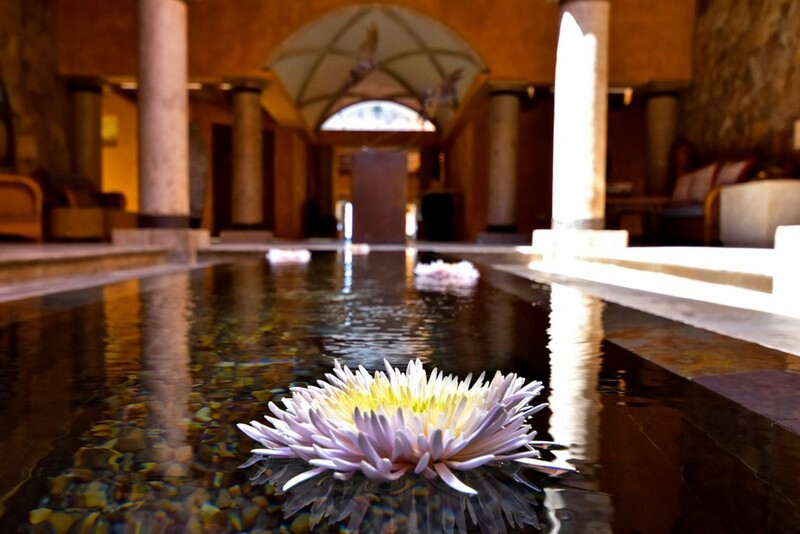 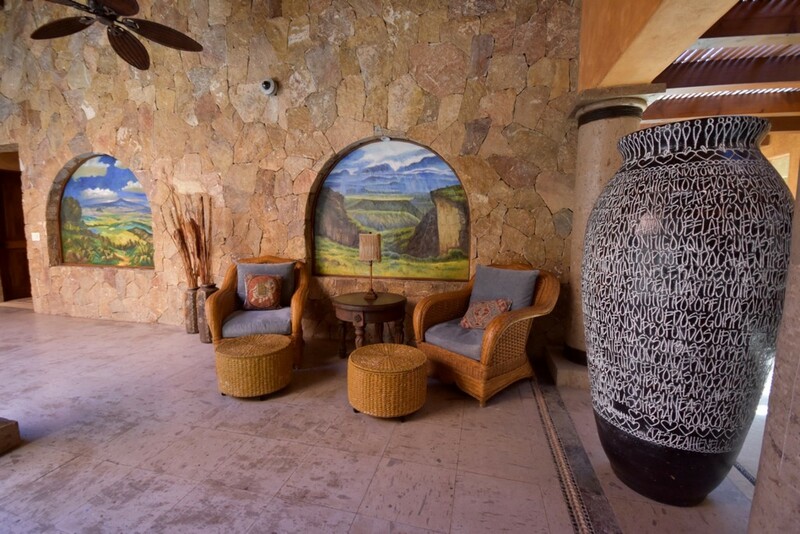 The high-ceilinged foyer, replete with beautiful paintings inset into round arches that are spaced evenly down the foyer walls, spans over a long pond water feature, providing a gentle and peaceful ambience. 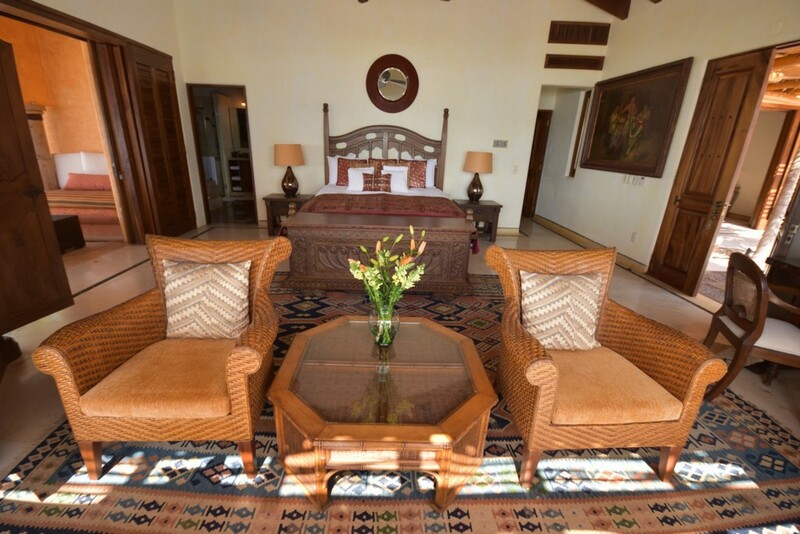 Surrounded by plush couches and sunlight streaming through the windows, guests will feel at ease from the moment they enter the villa. 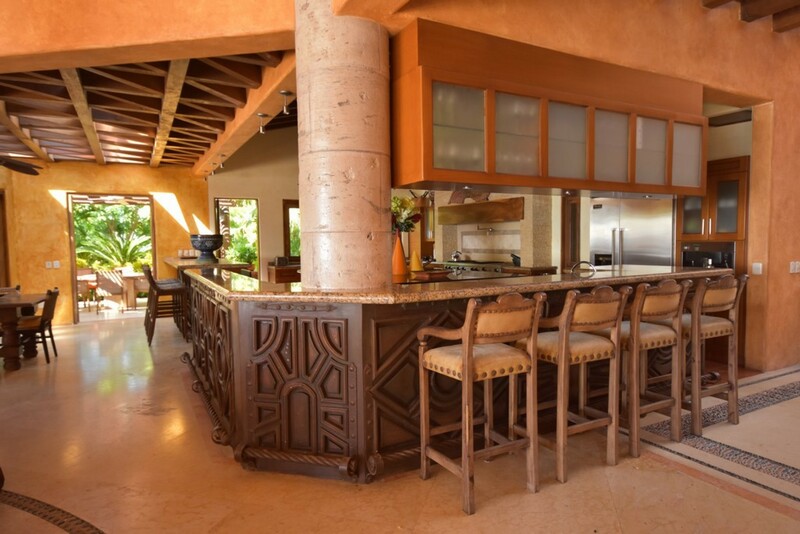 The interior takes the outside in; the textured stone masonry gives the impression that the villa was hewn from sheer red rock, while the marble finish provides the contrast with smooth, cool surfaces on the pillars and floors. 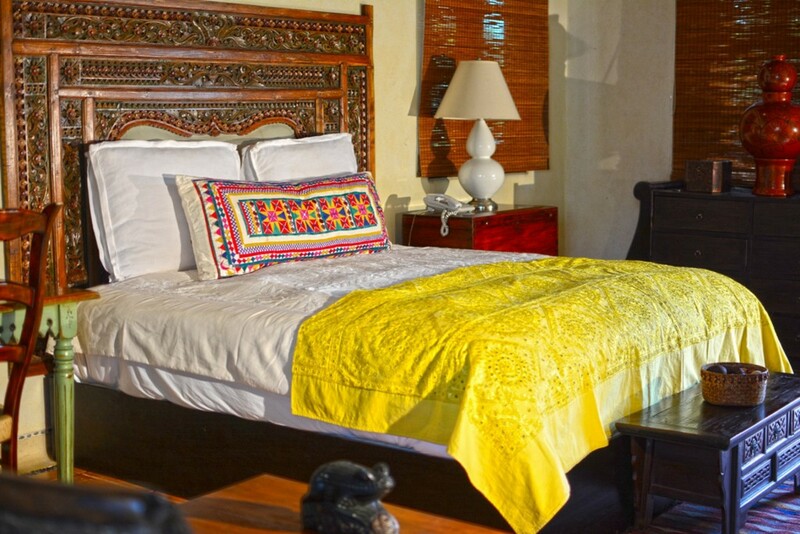 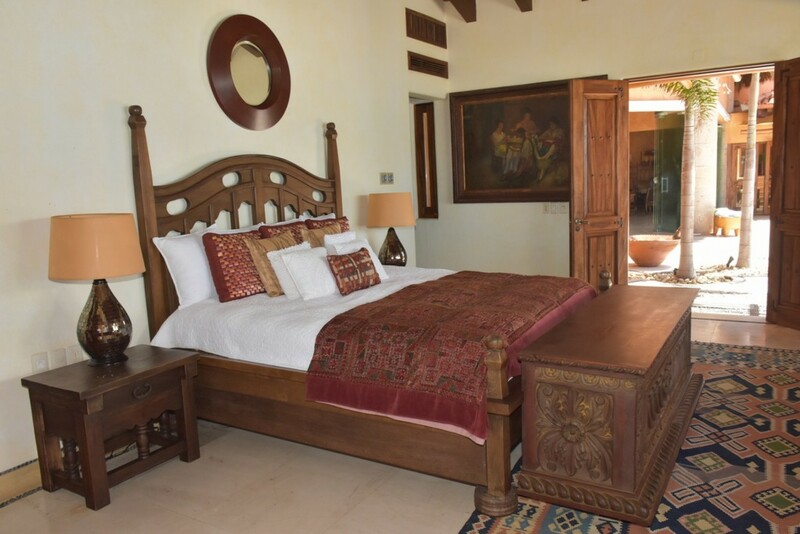 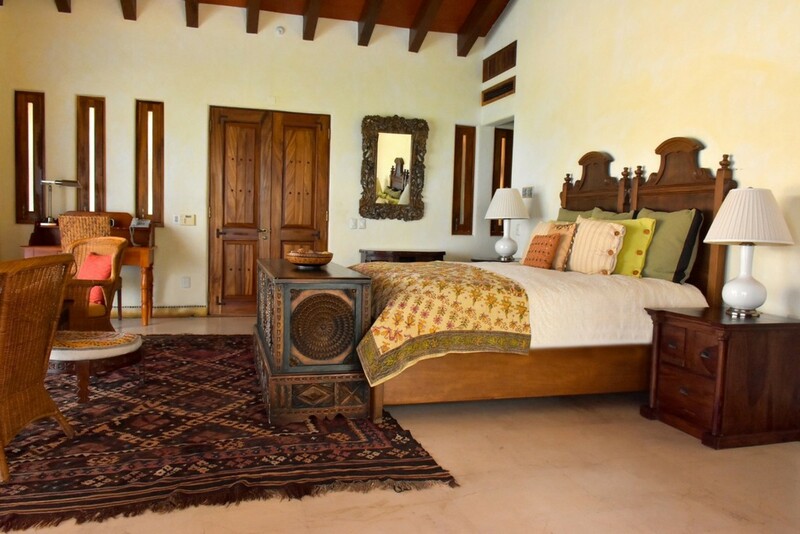 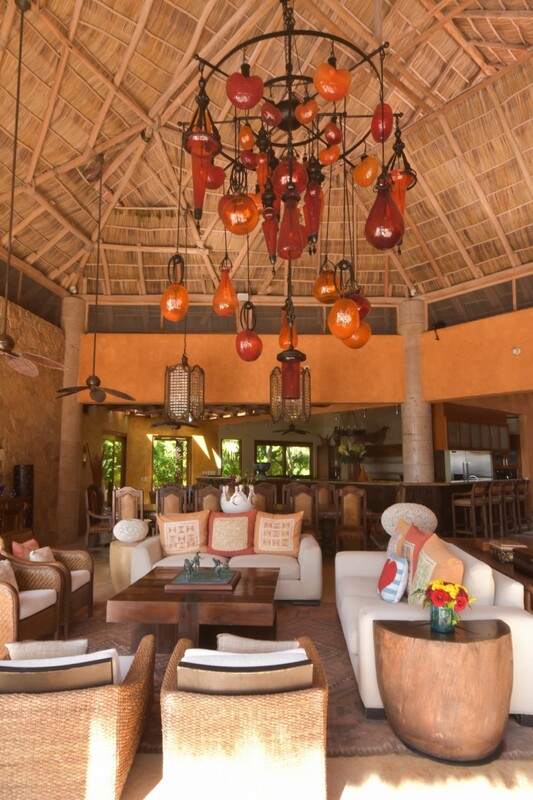 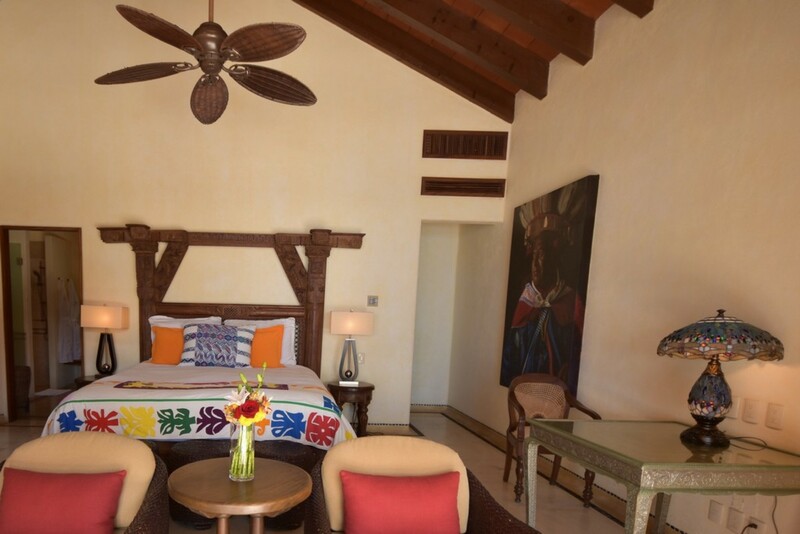 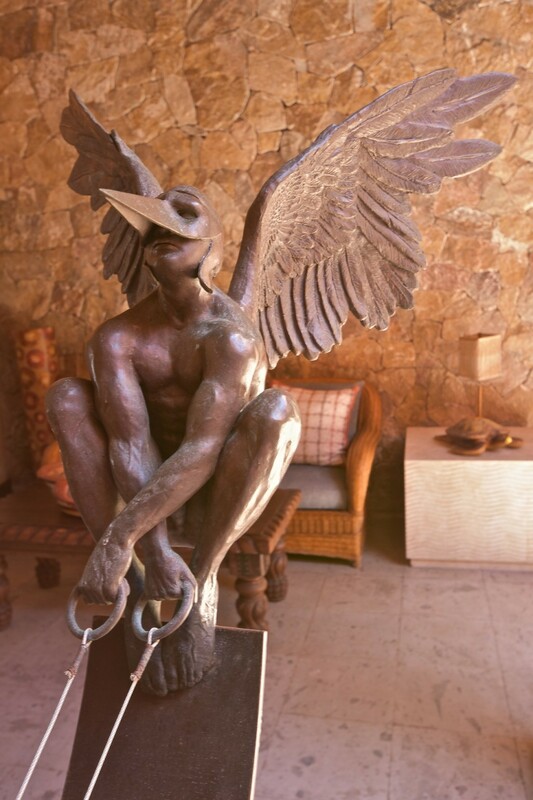 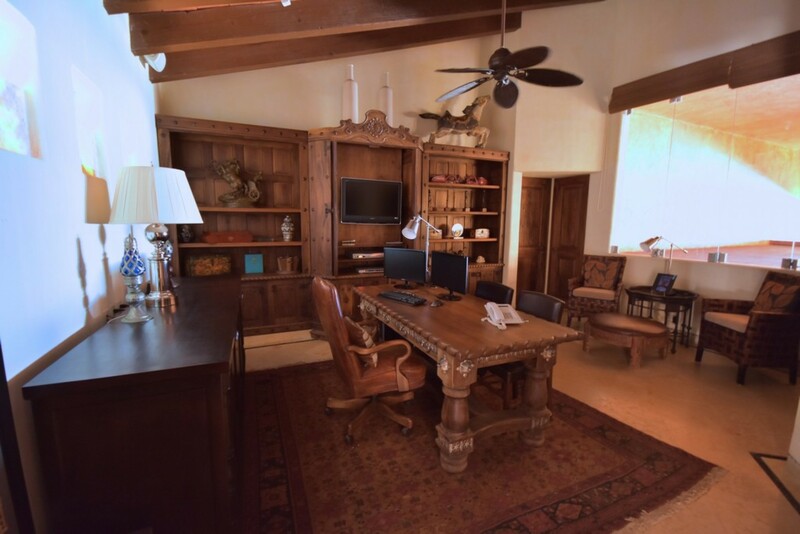 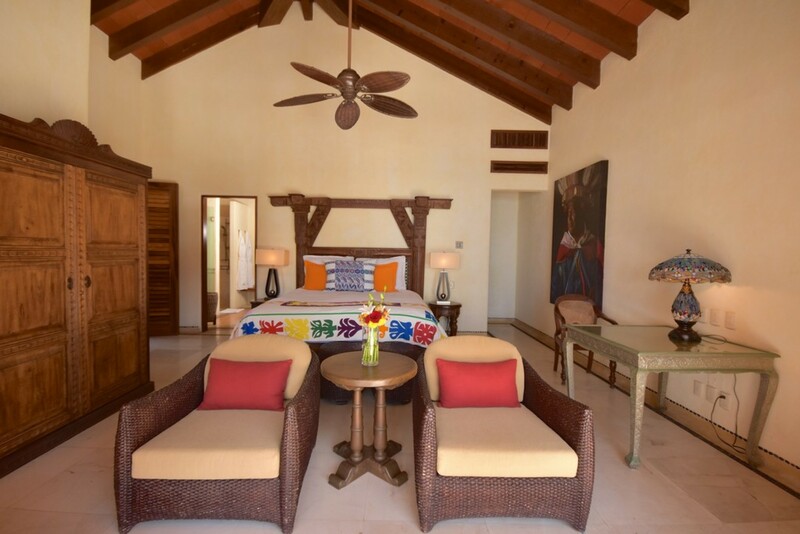 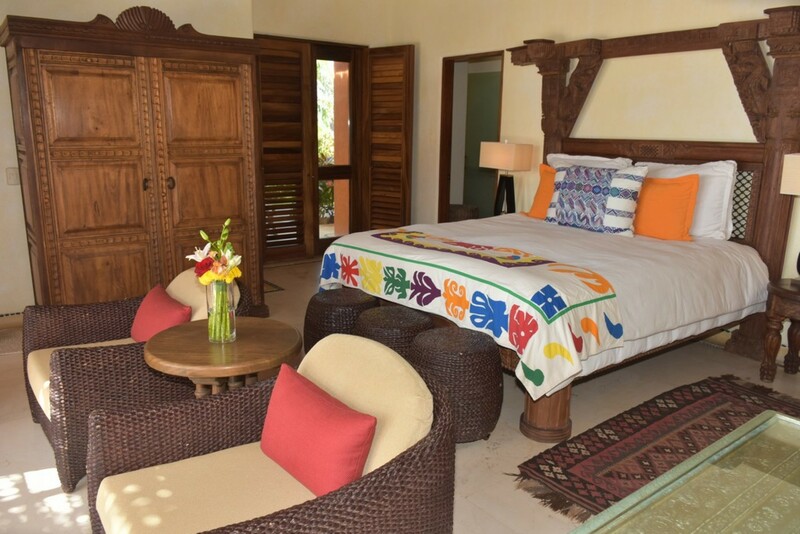 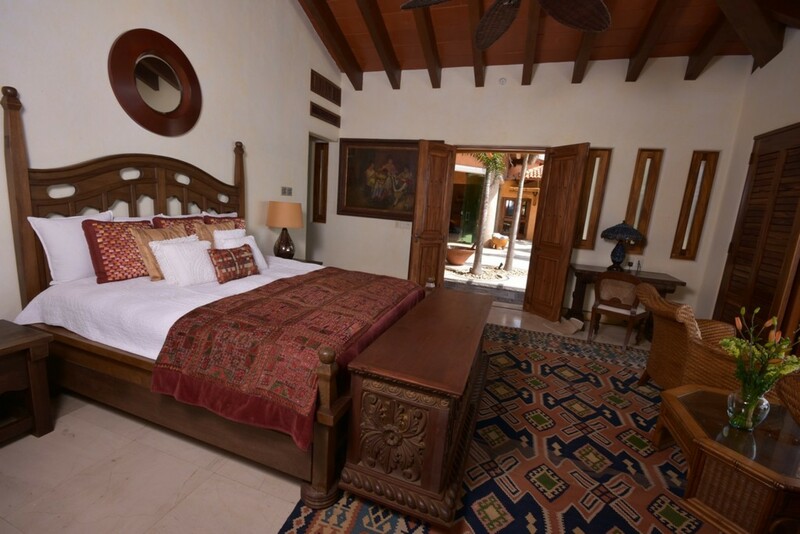 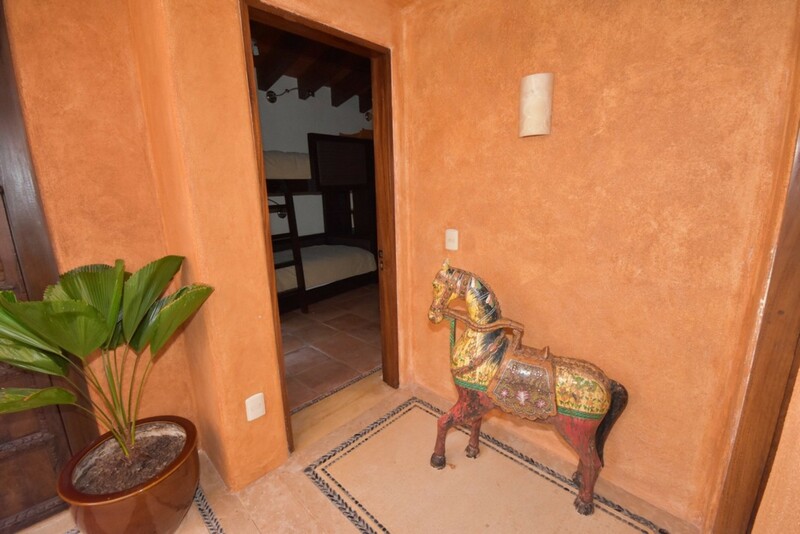 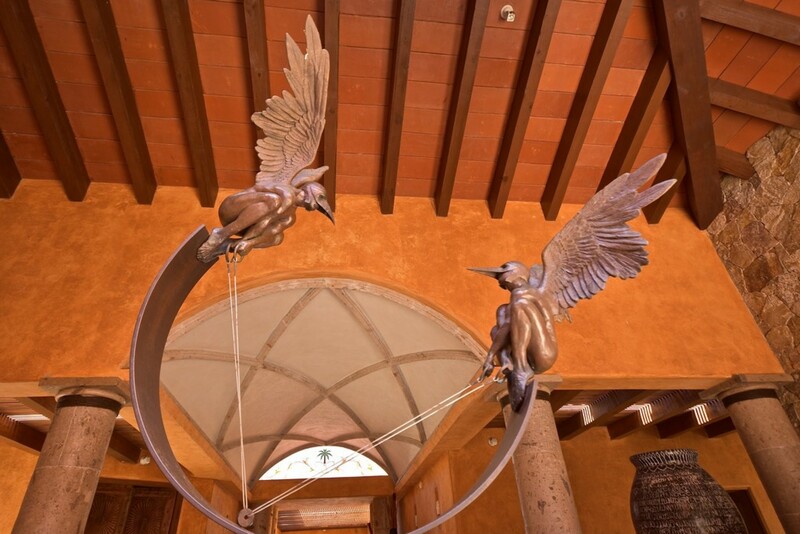 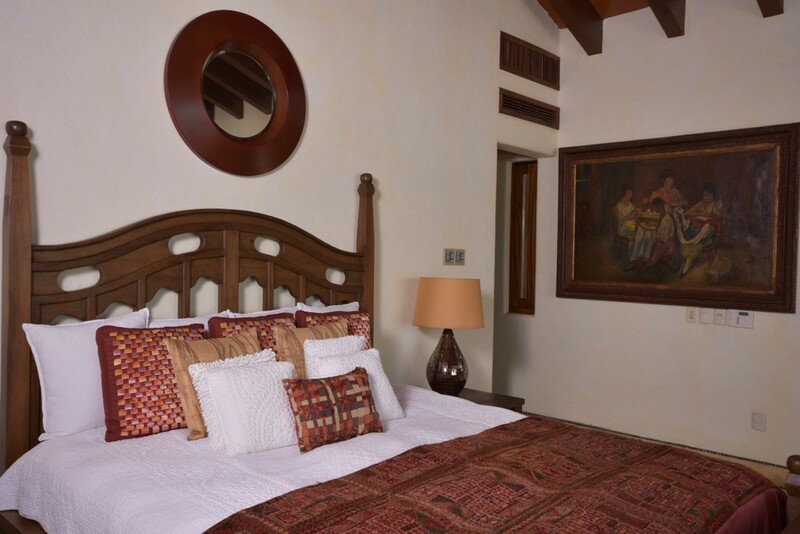 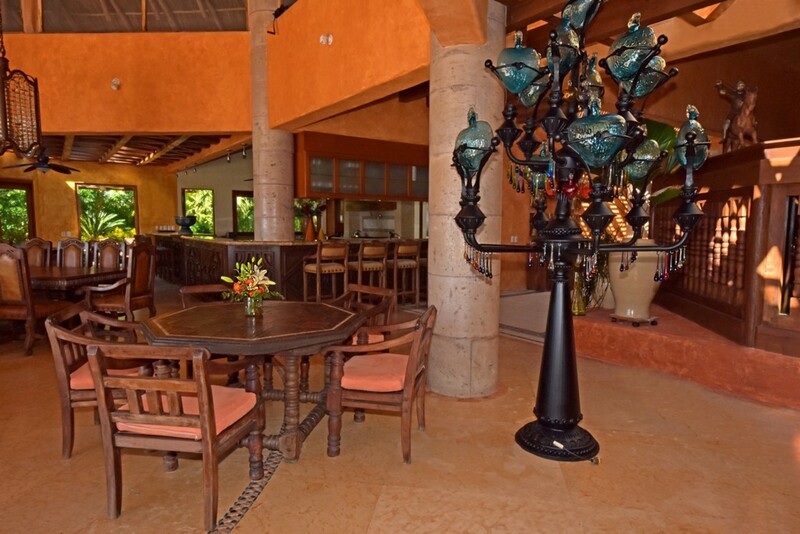 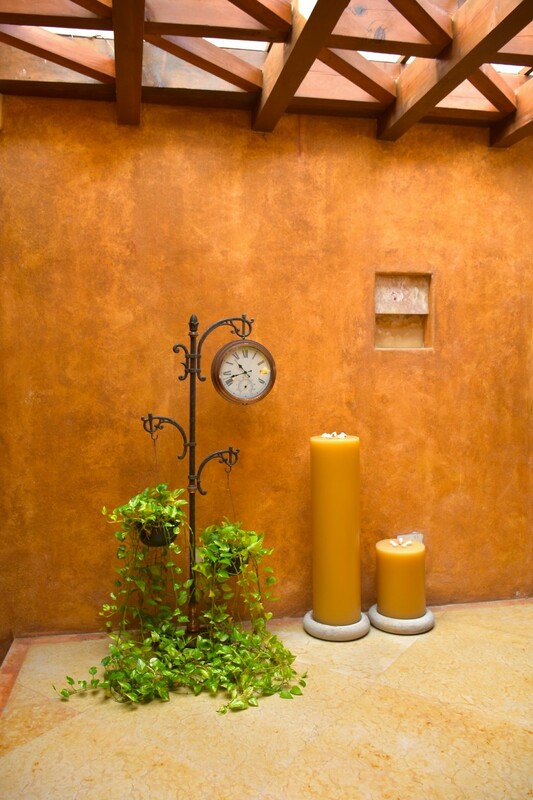 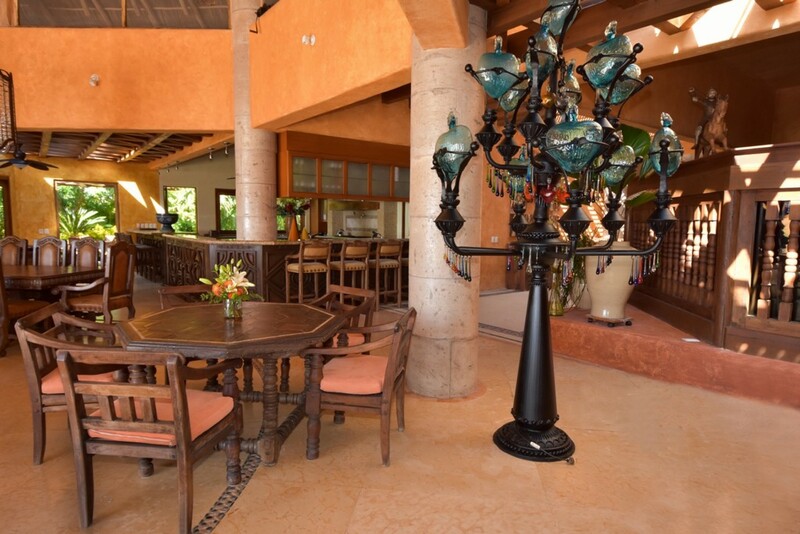 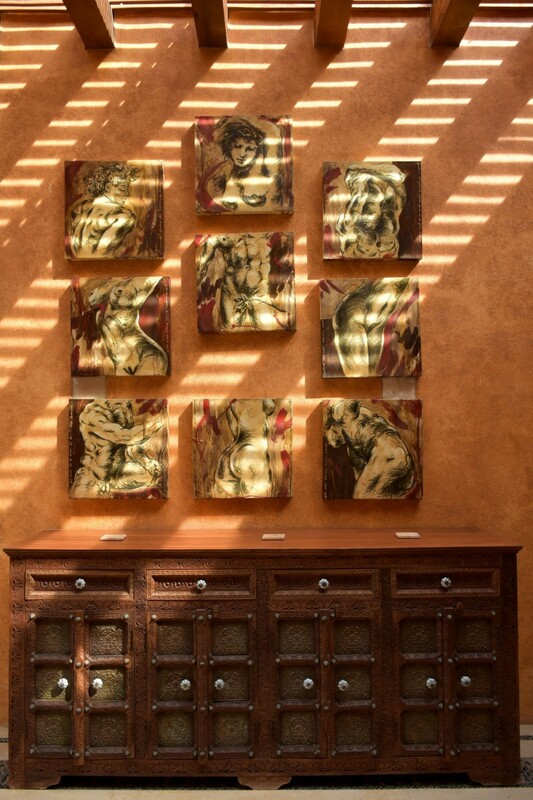 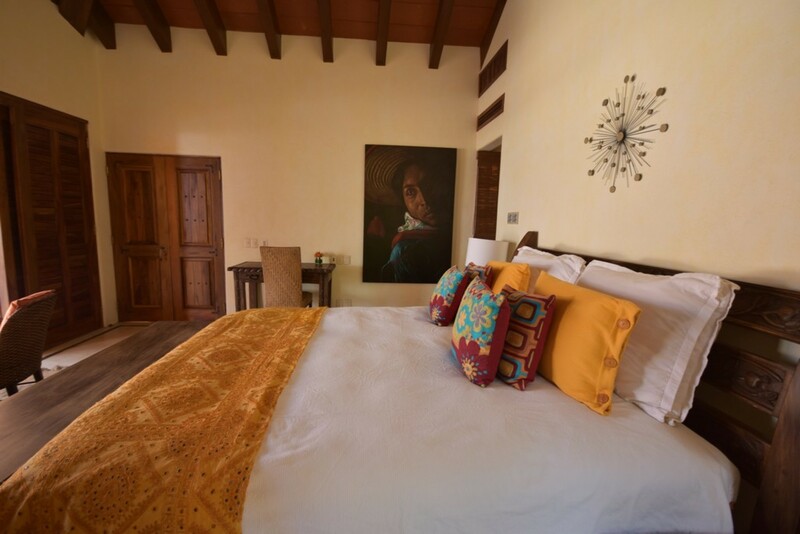 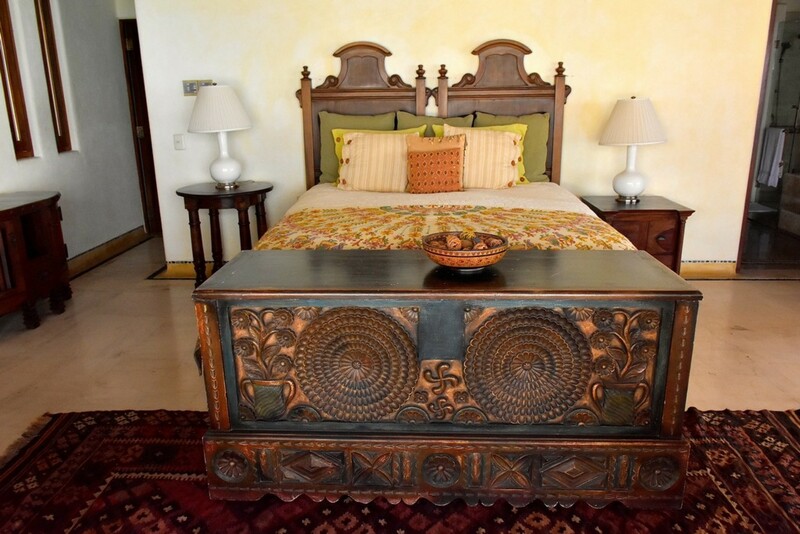 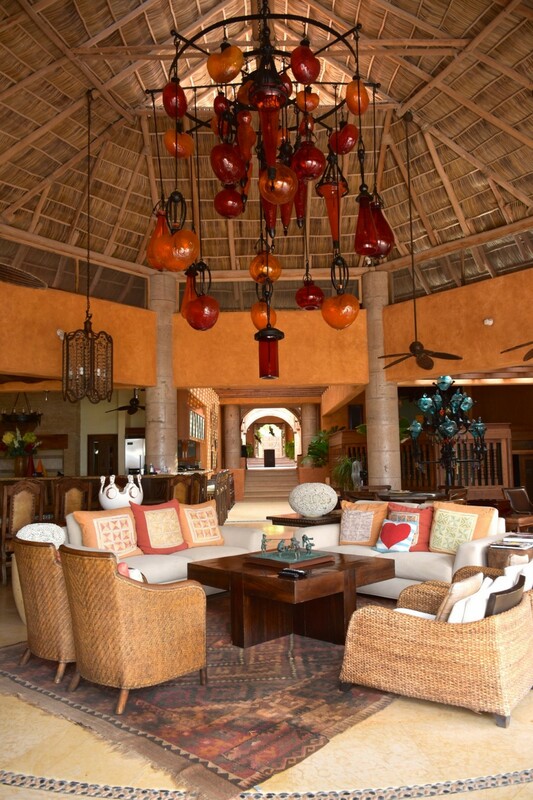 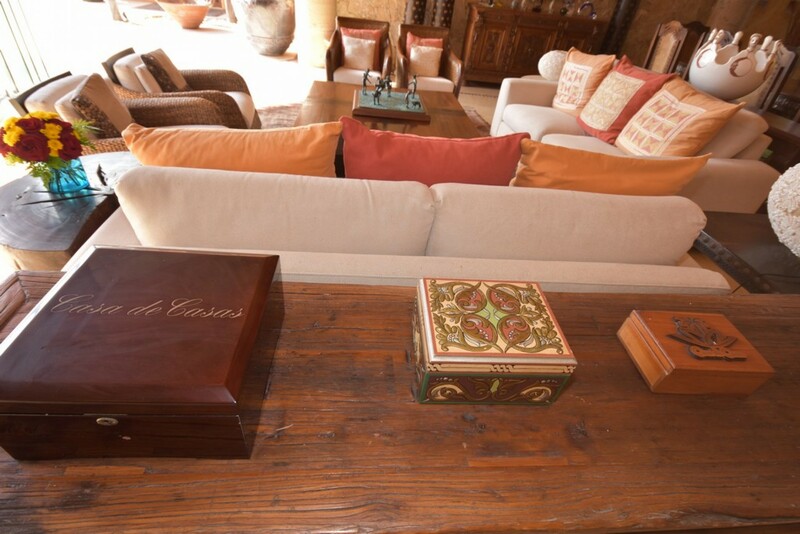 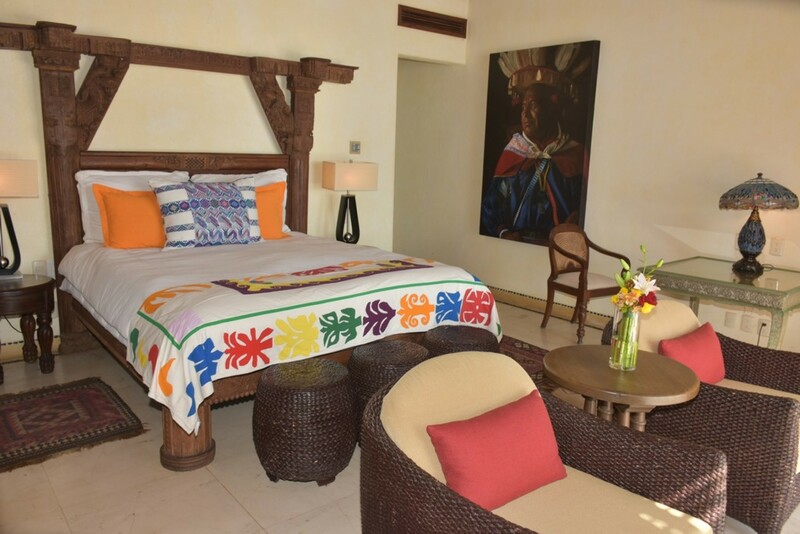 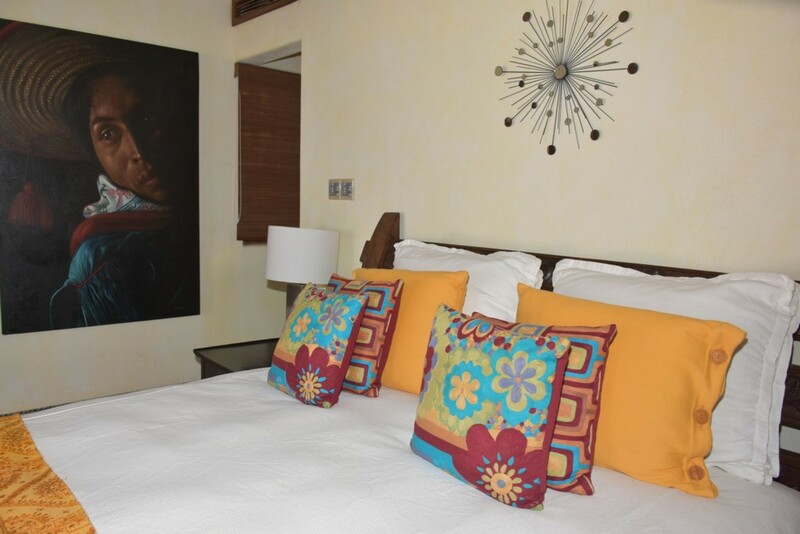 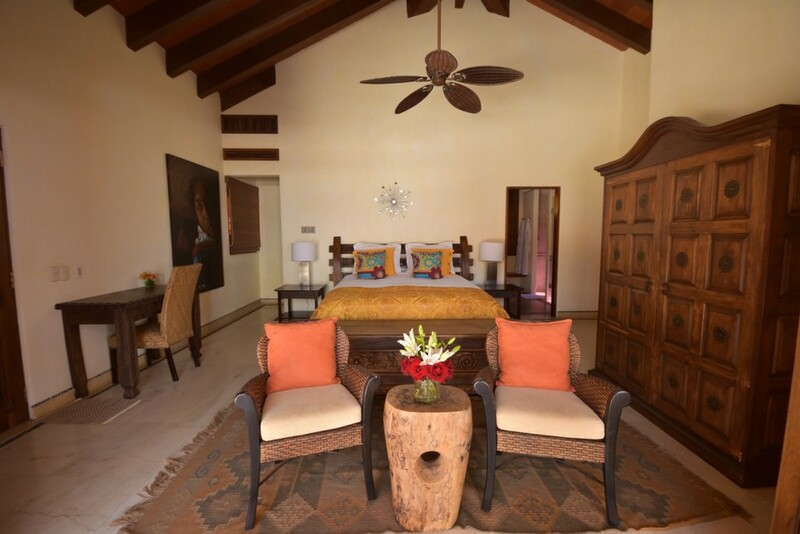 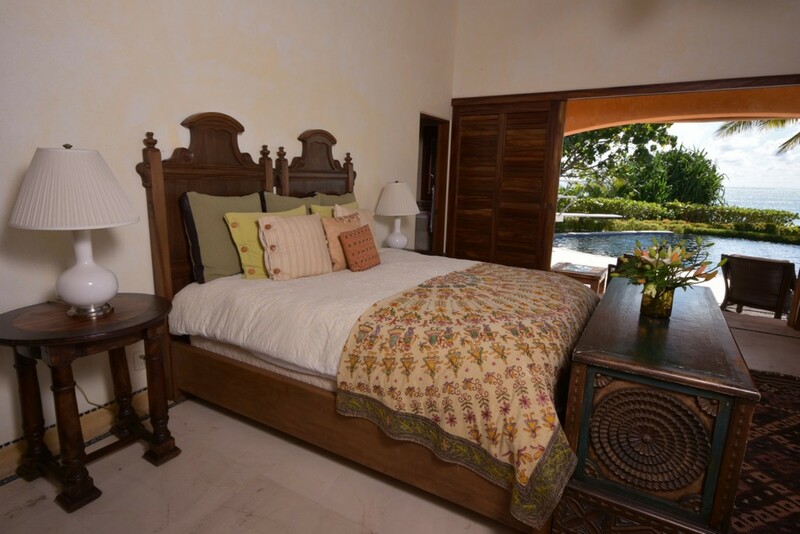 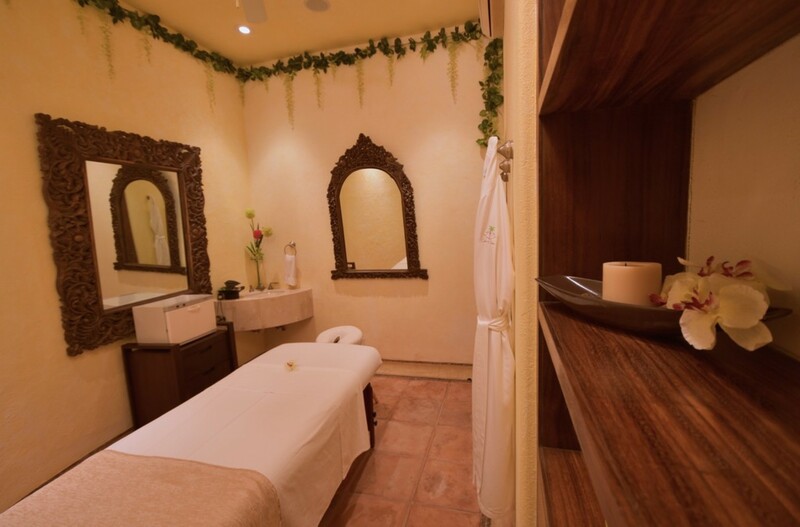 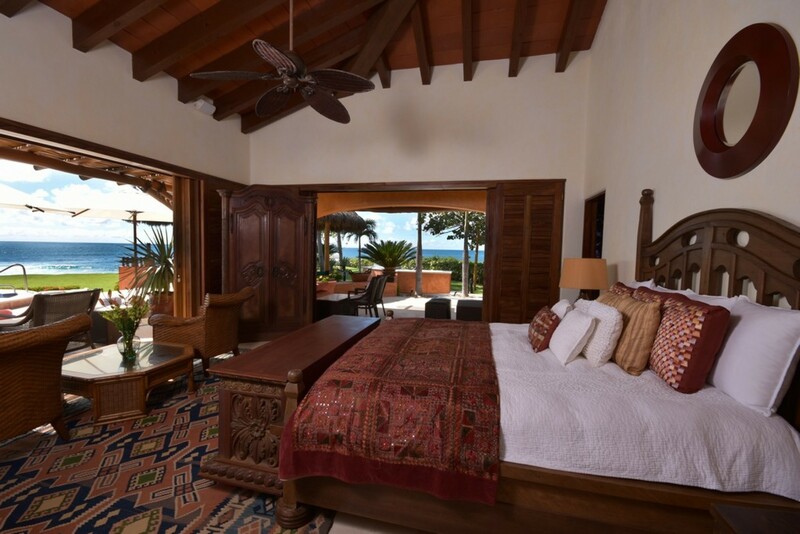 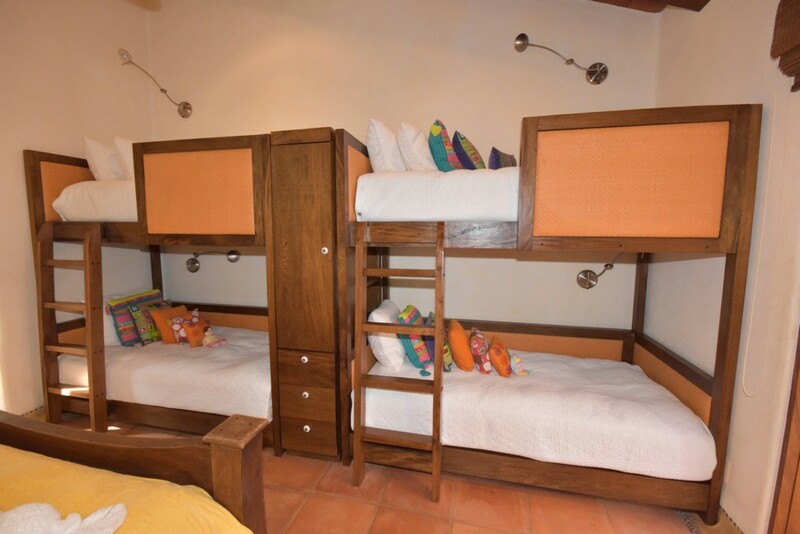 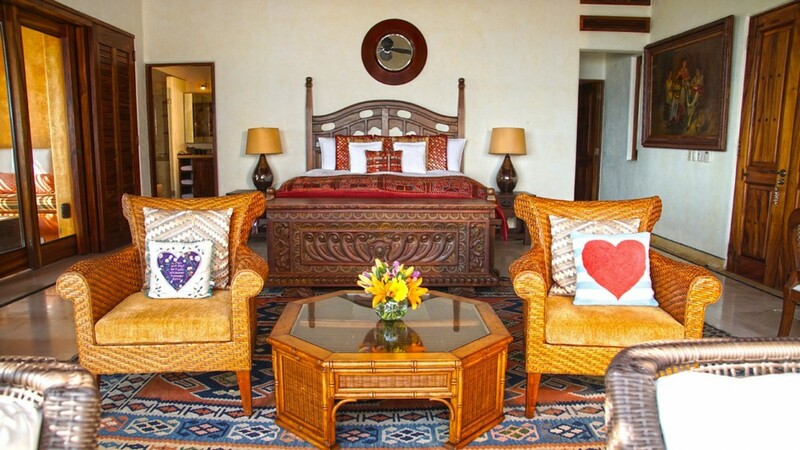 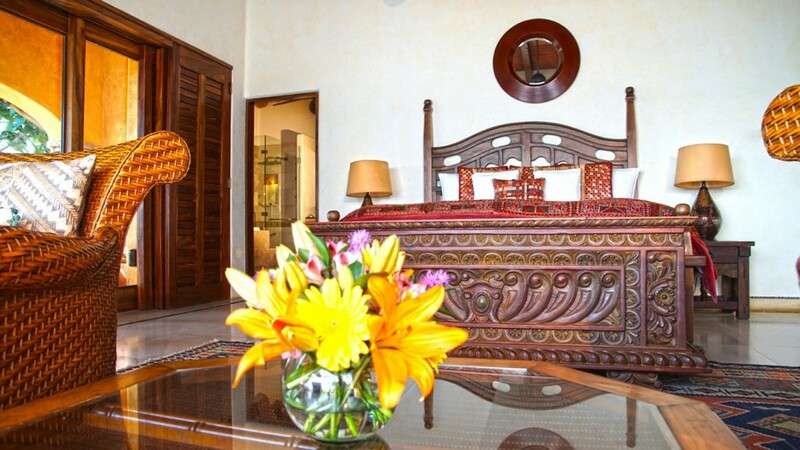 Adding to this the richly-detailed carved woods of the furniture that populates each room, and the antiquated heirlooms and accents sourced locally, Casa de Casas offers the finest in Mexican design and architecture, while offering a warm welcome to people from far and wide. 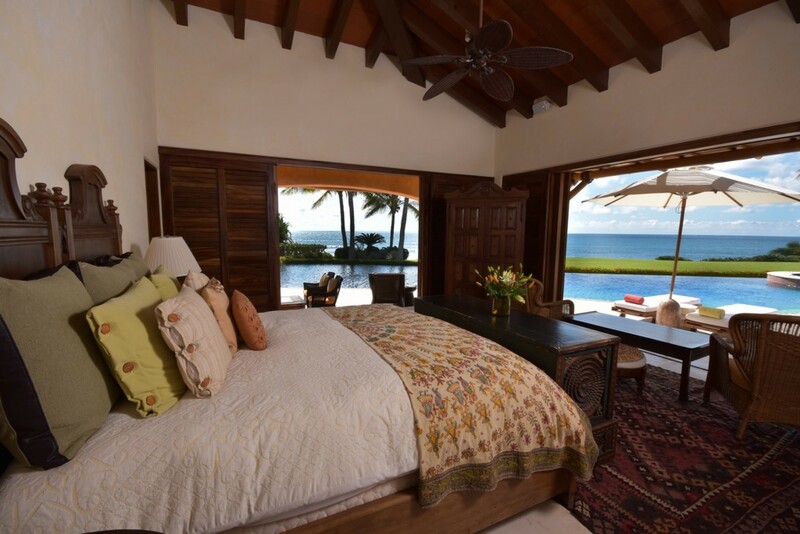 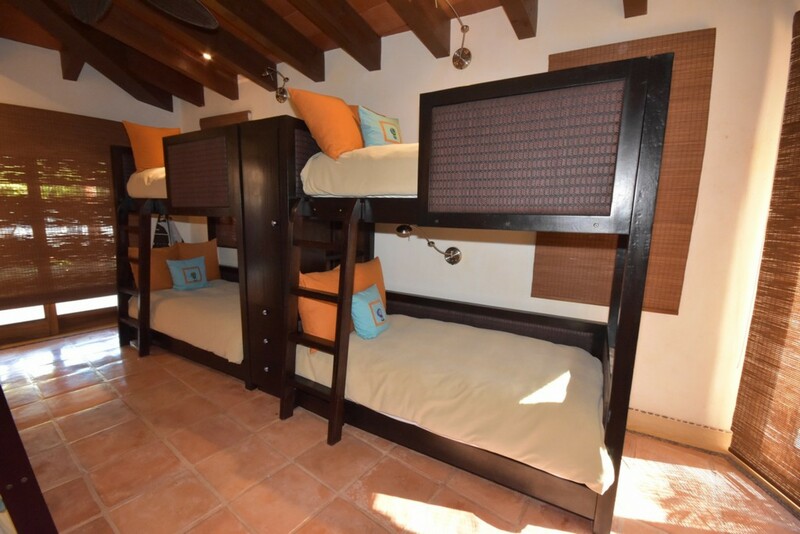 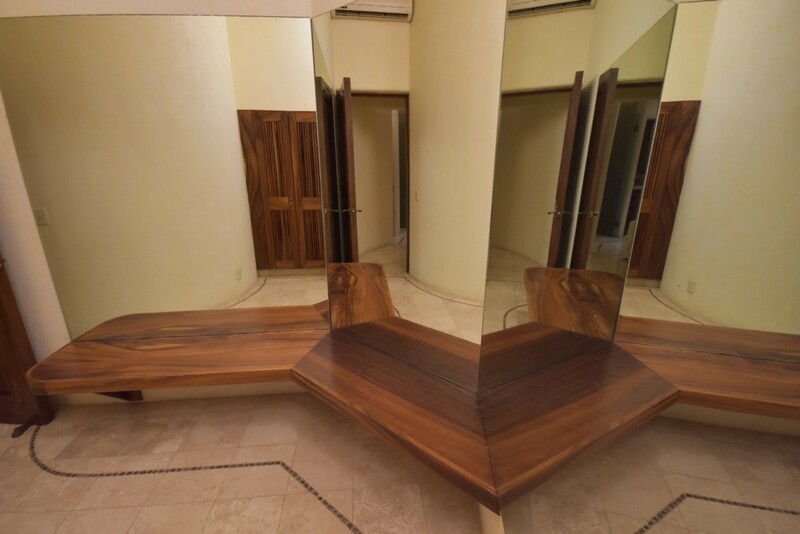 Casa de Casas’ opulence is in part due to the amount of time spent both designing and building the villa; two years in the design, and a further two years for its construction, by distinguished architect Marta Lozano, whom Villa Marta, the standalone bedroom suite, has been named after. 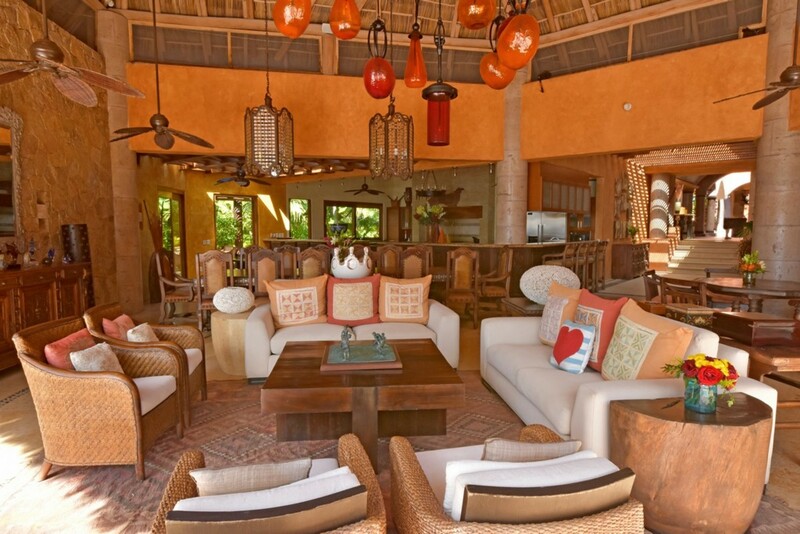 The great room combines kitchen, lounge and dining room into one, a vaulted ceiling embellished with hanging ornamental lights and ornate ceiling fans. 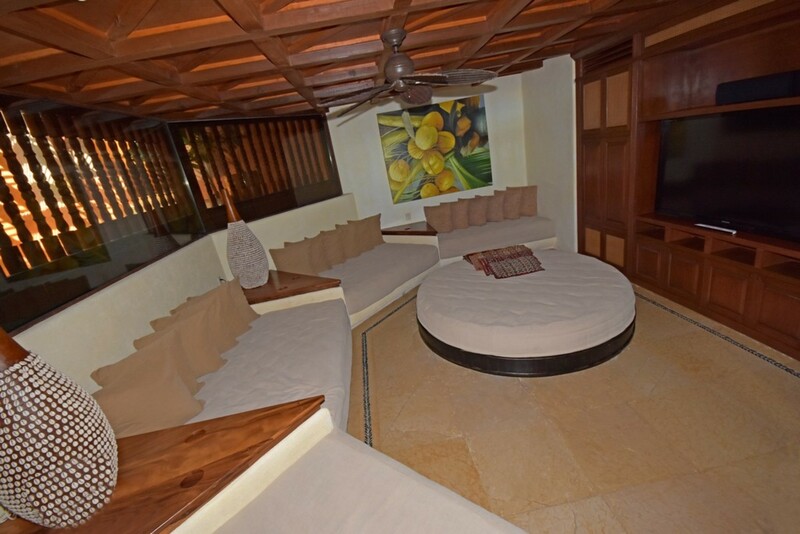 With ample seating for guests to enjoy, the great room caters to both large groups of people around the coffee table surrounded by plush couches and chairs, perfect for entertaining, or in more intimate settings, such as the quiet ambience of the foyer, or even the couches and uniquely stylized sofa made from a boat on the terrace, directly accessible from the great room. 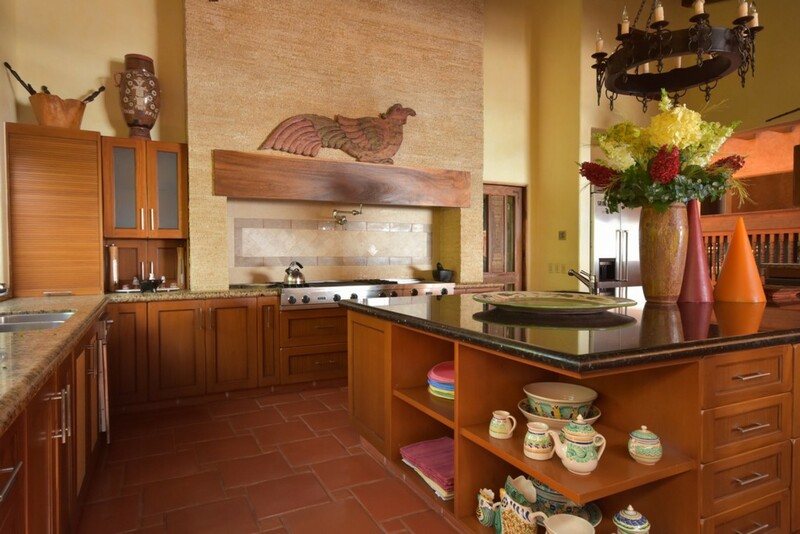 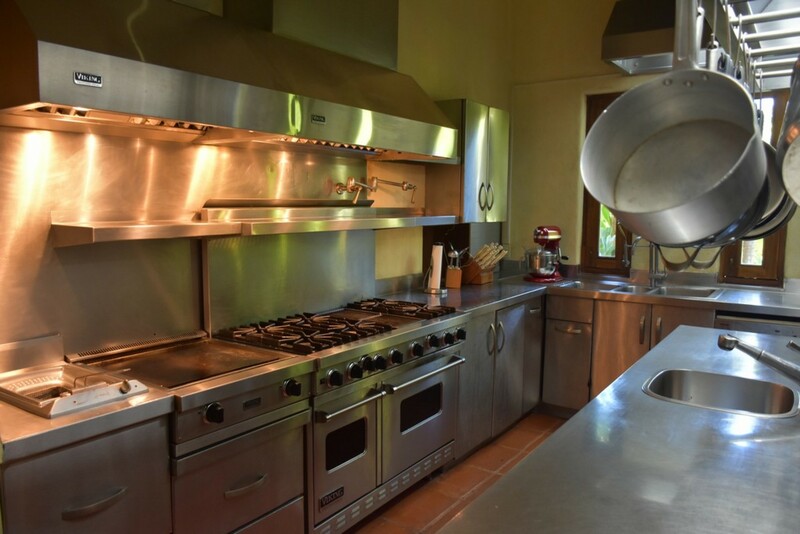 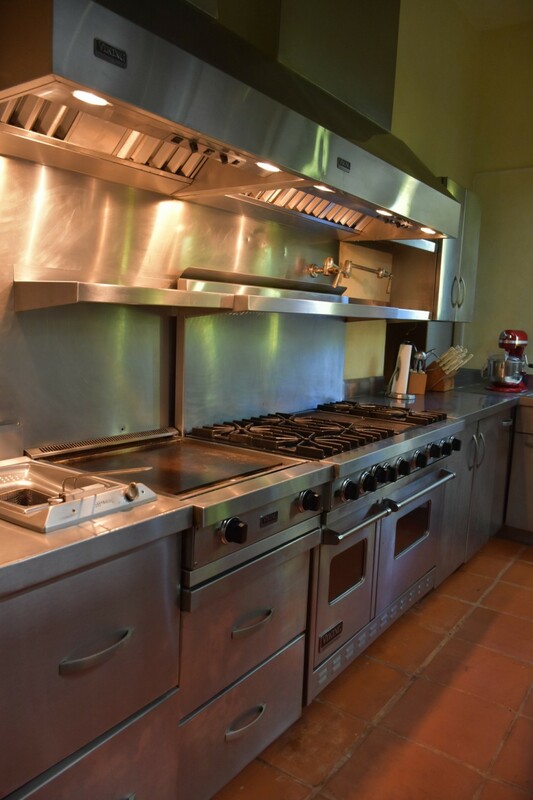 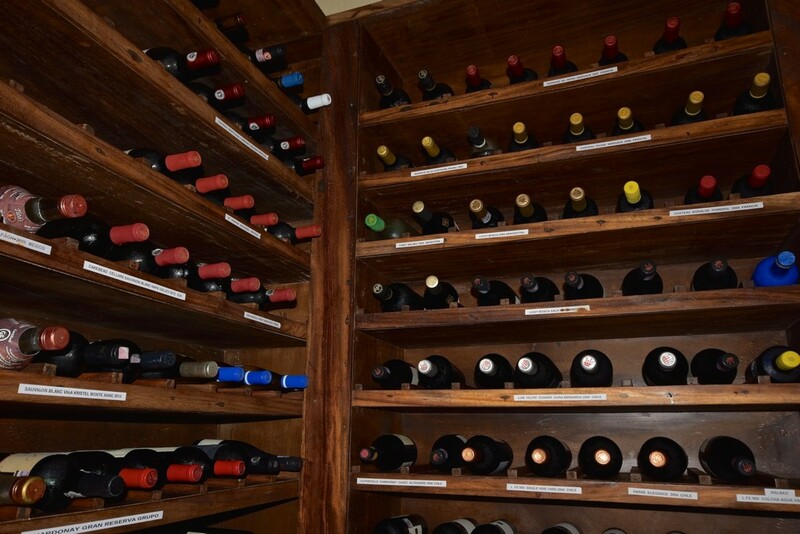 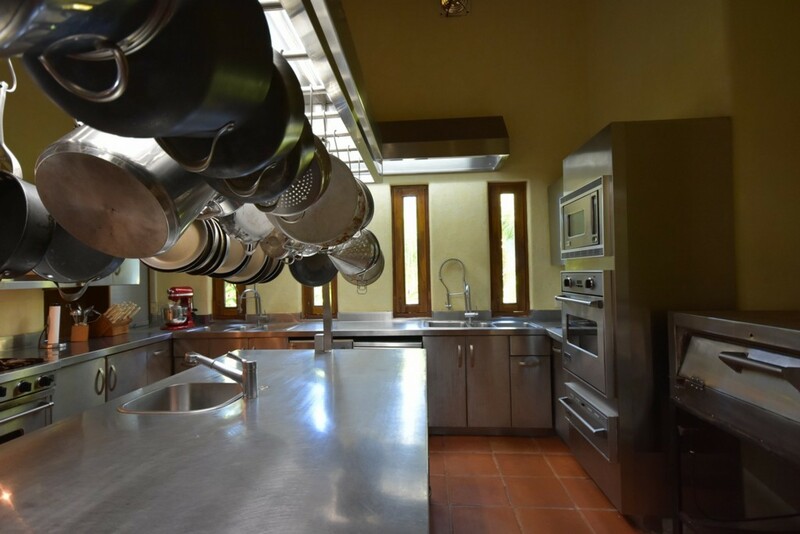 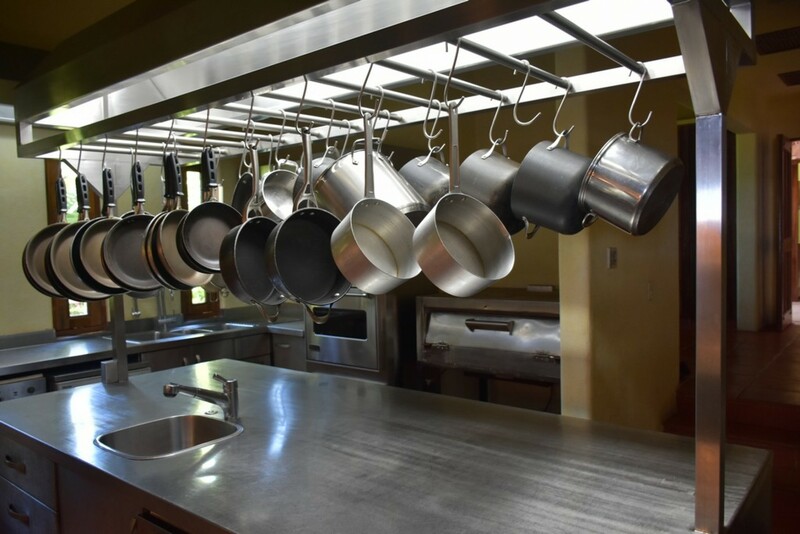 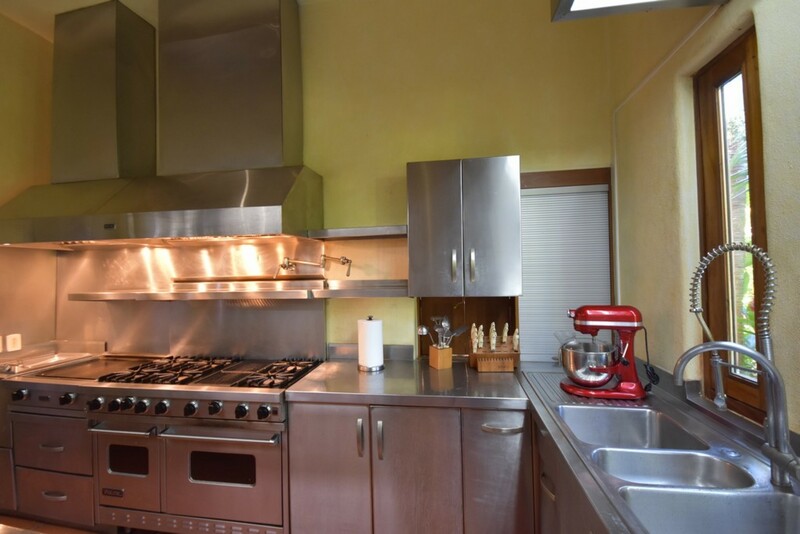 A fully equipped kitchen with state-of-the-art appliances ensures that the hard work is taken out of food preparation. 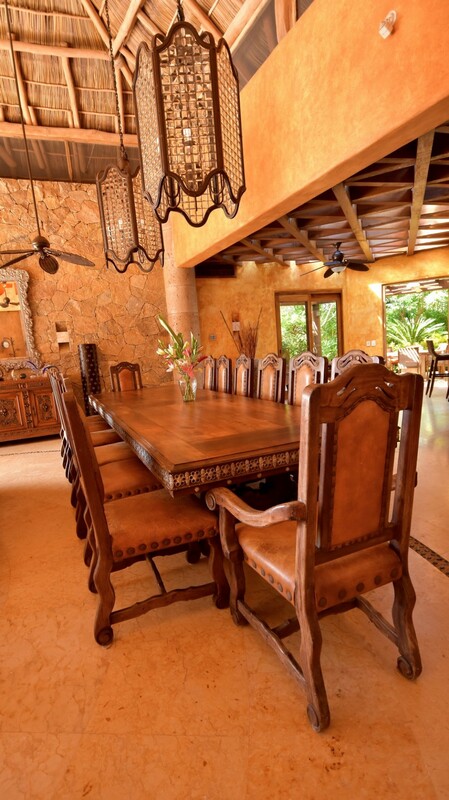 The sizeable breakfast bar seats 8 at a time, and the large dining table seats a grand total of 14, ensuring that all guests can eat in comfort, to say nothing of the 6-seater round table sitting adjacent to the couches. 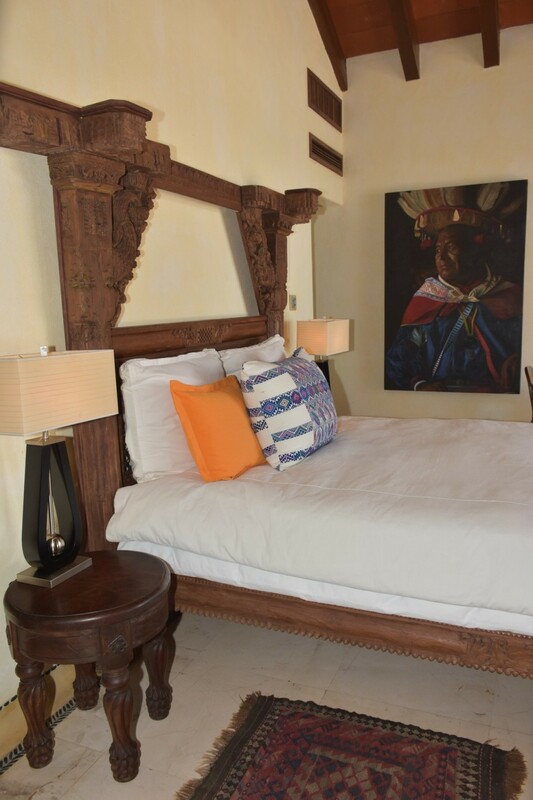 The bedrooms are nothing short of luxury; five of the seven bedrooms have been outfitted with a luxury California King size bed, with lavish bed linens fit for royalty, and bespoke furnishings that are constructed with an expert finish. 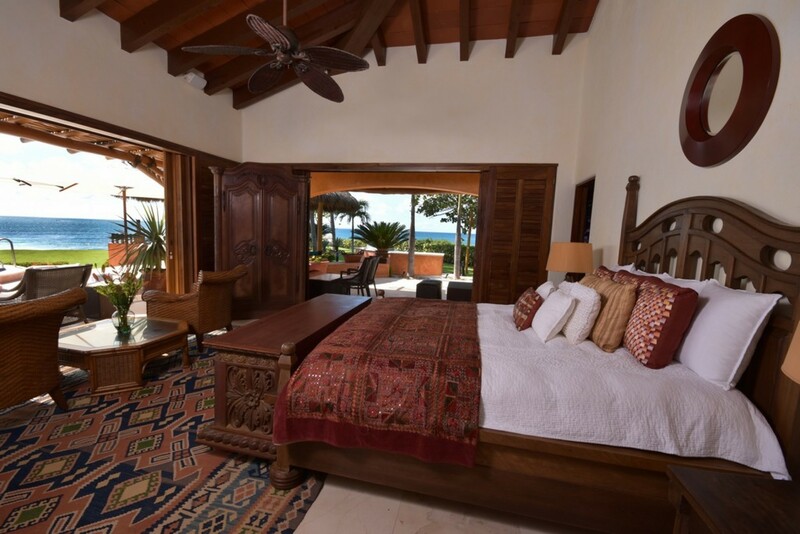 A private patio area is afforded to the two master suites and two guest suites, replete with comfortable seating, perfect for early risers relaxing outside with a coffee, or curling up with a book in the light of the evening sun. 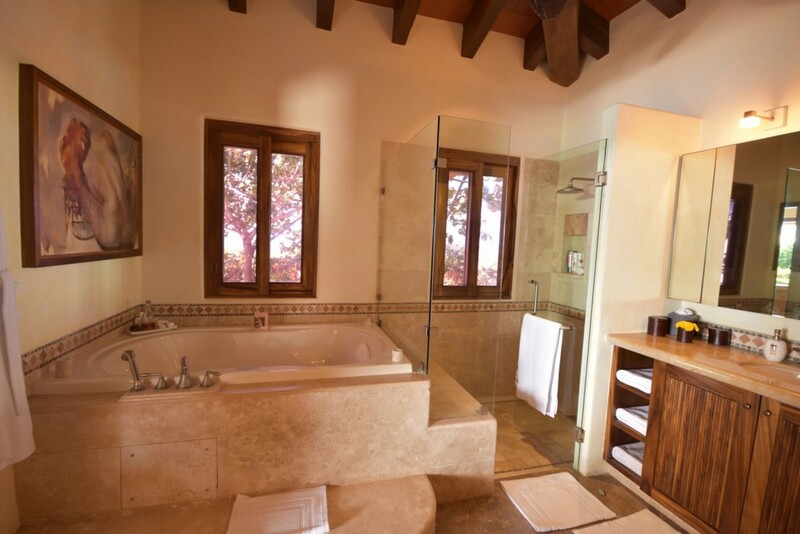 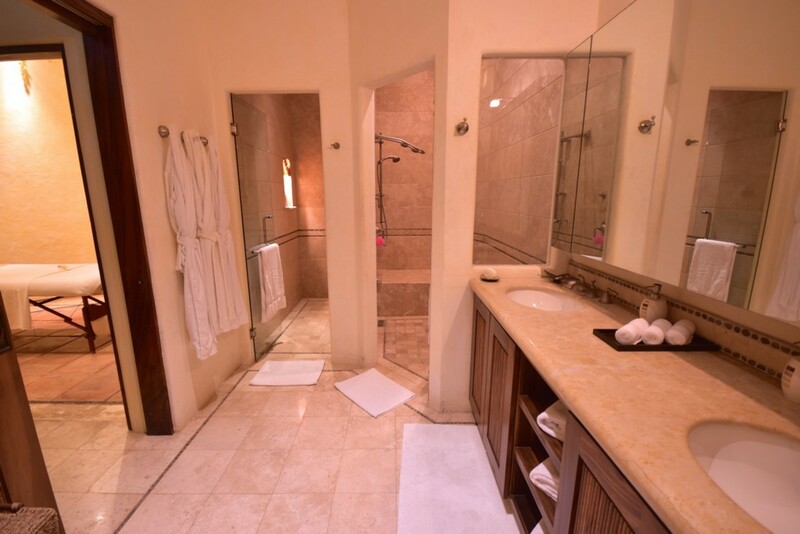 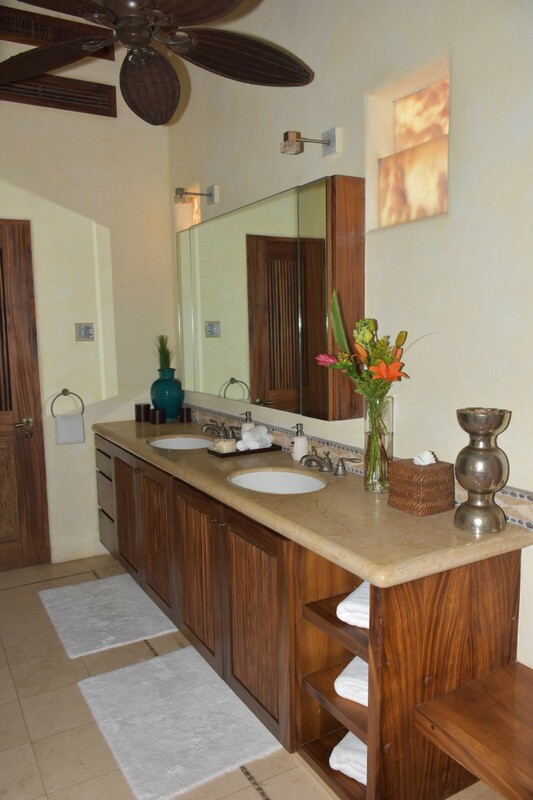 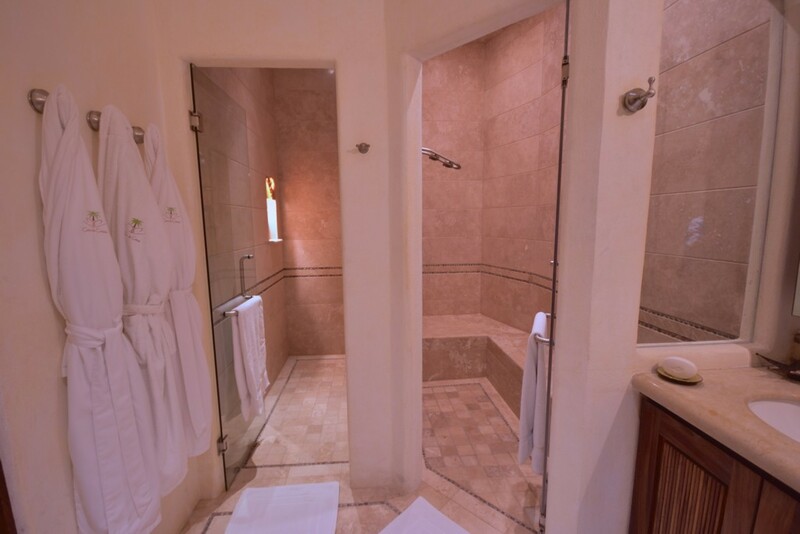 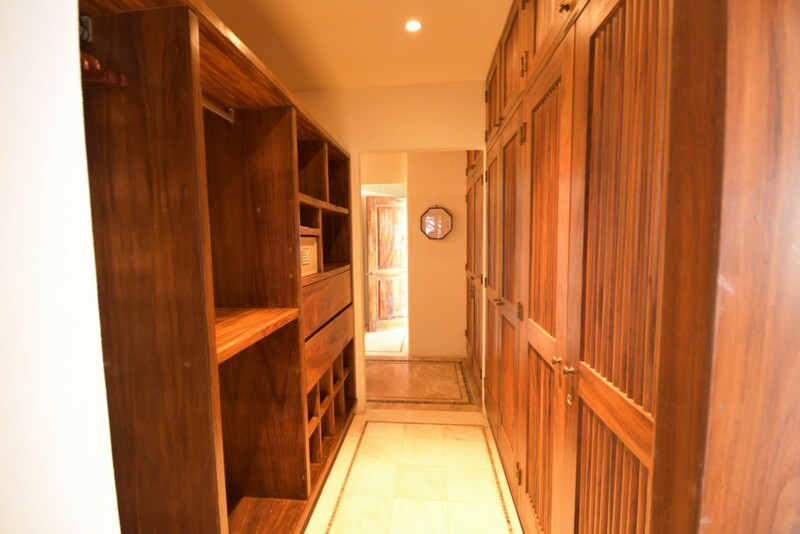 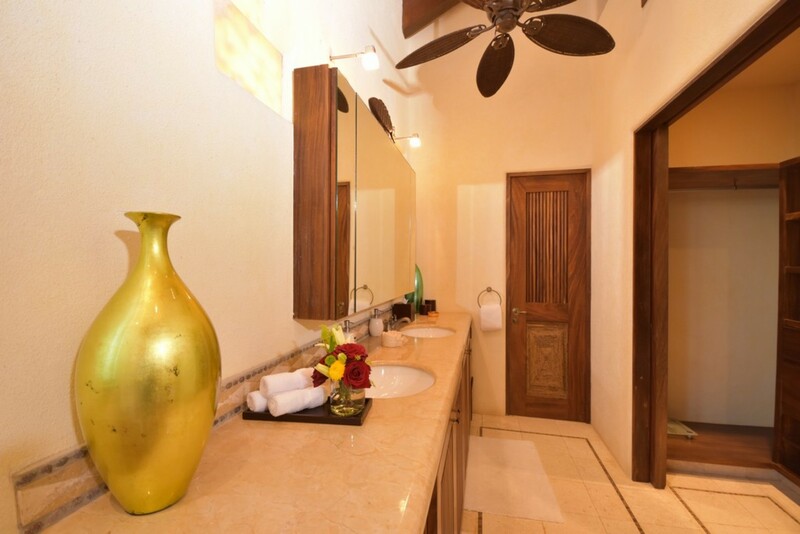 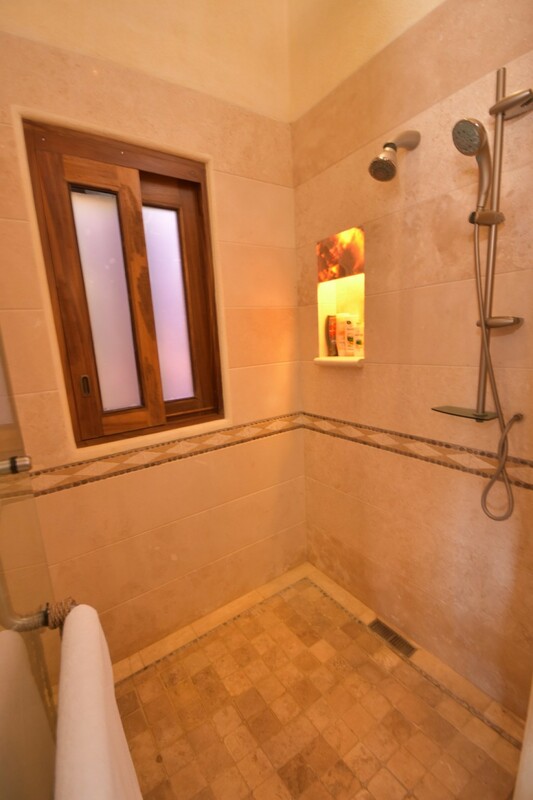 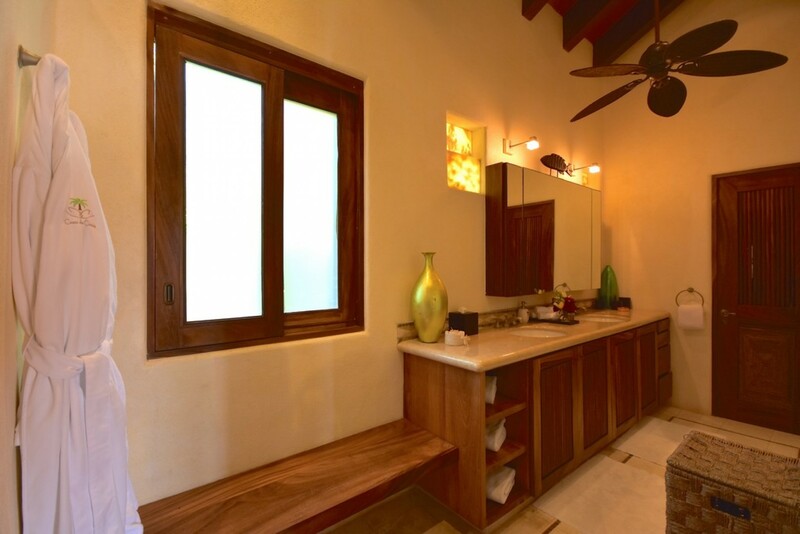 Private en-suites are attached to each bedroom, the two master bedrooms and the family suite having a whirlpool bathtub and shower, and the remaining guest rooms containing a walk-in shower as part of their en-suites. 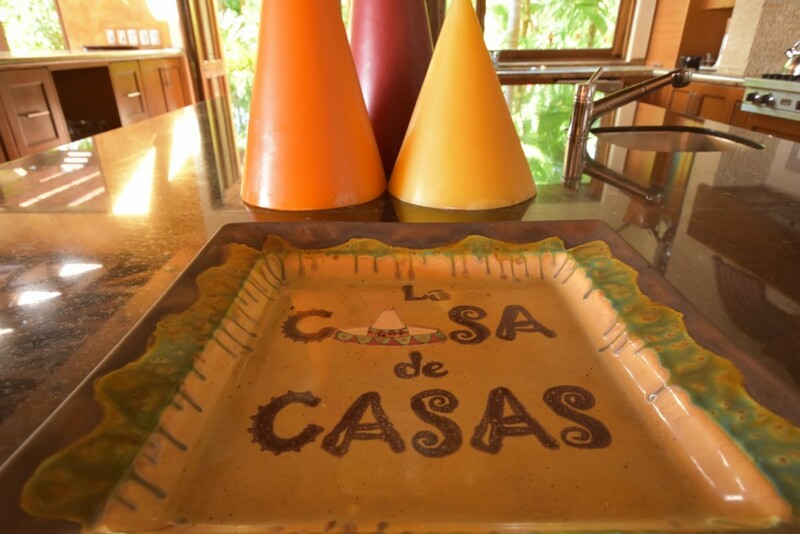 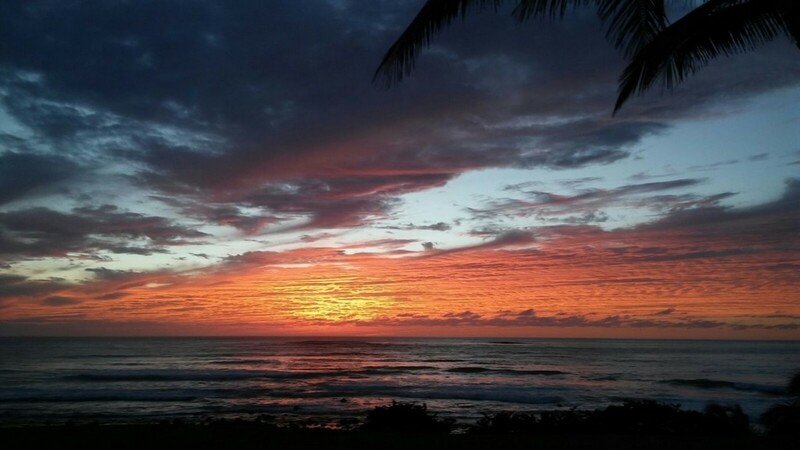 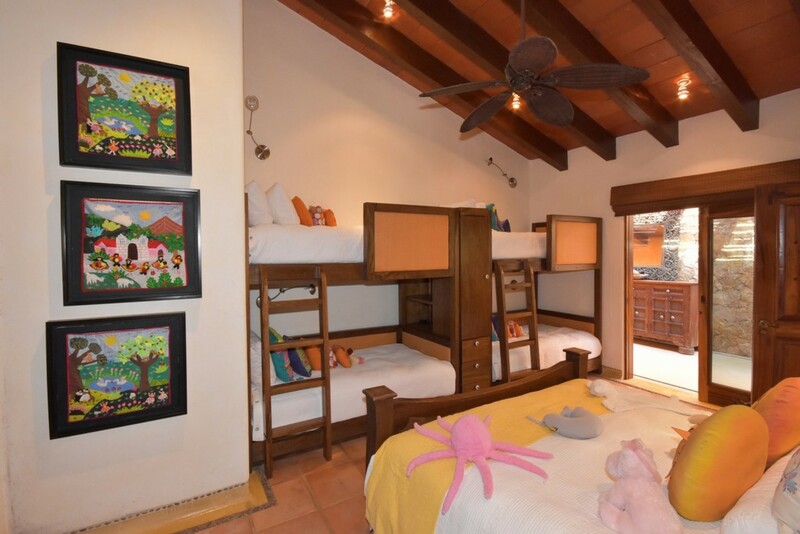 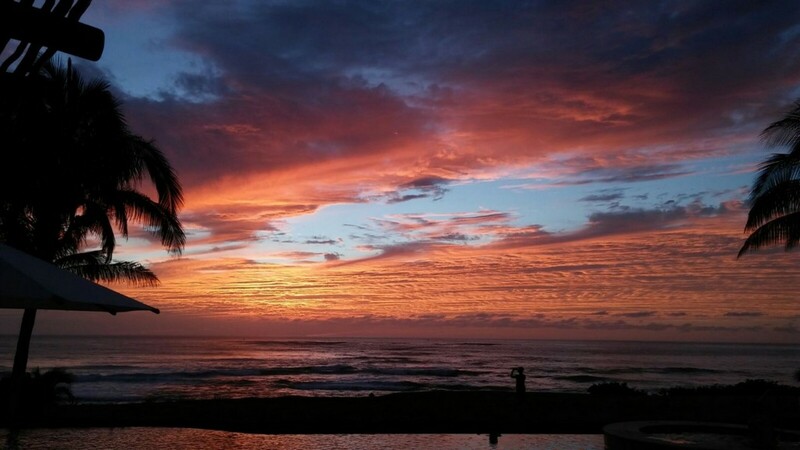 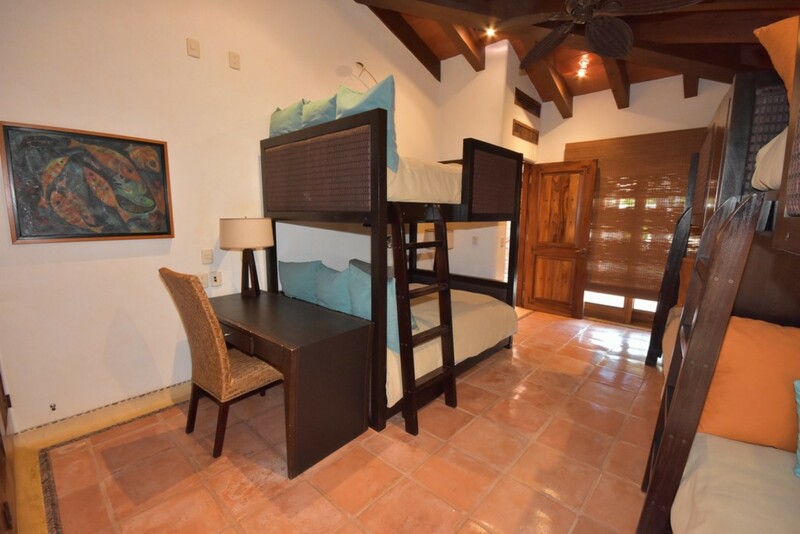 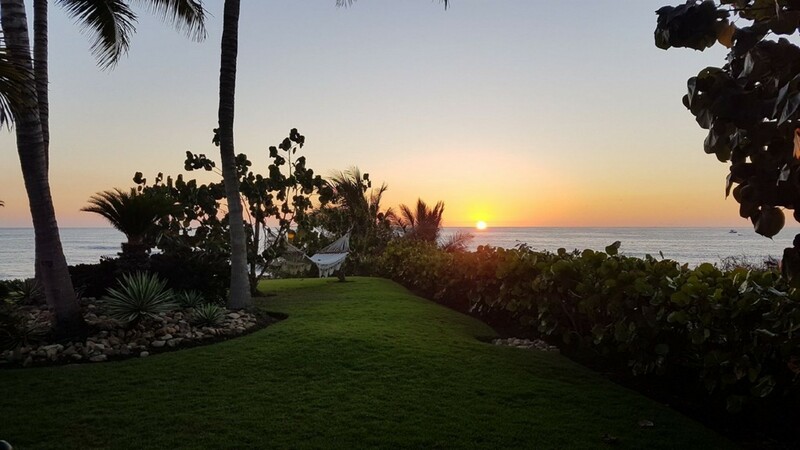 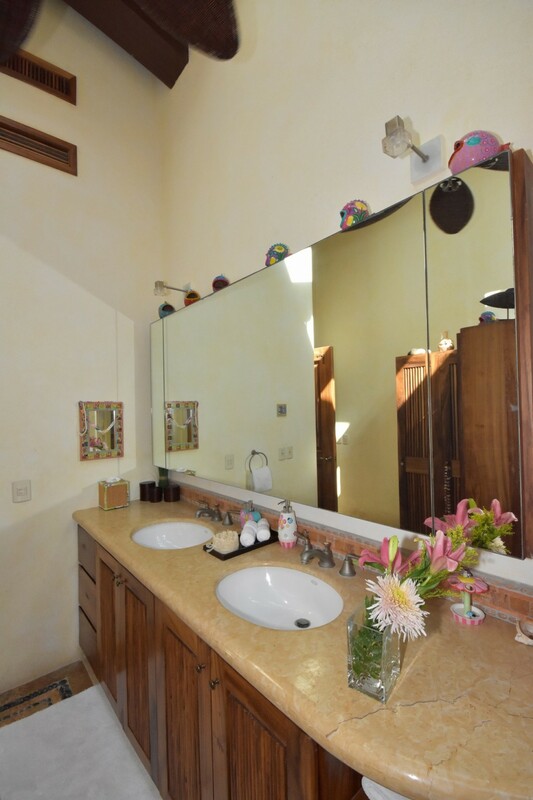 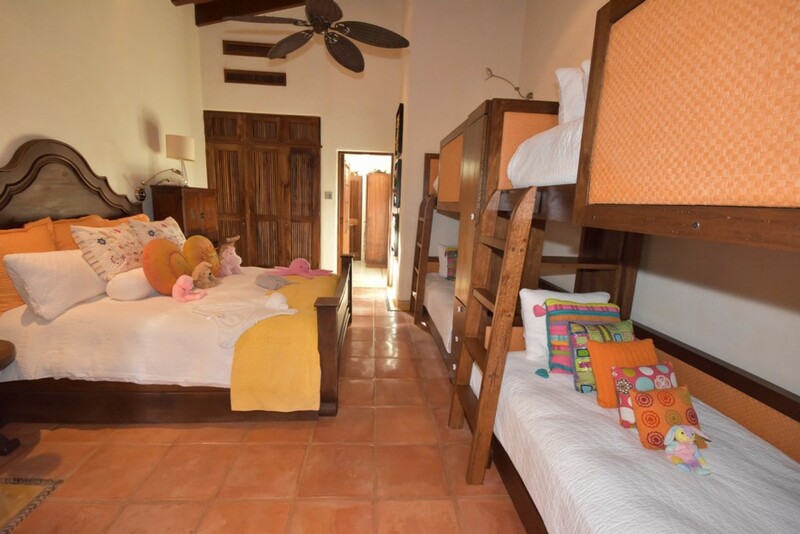 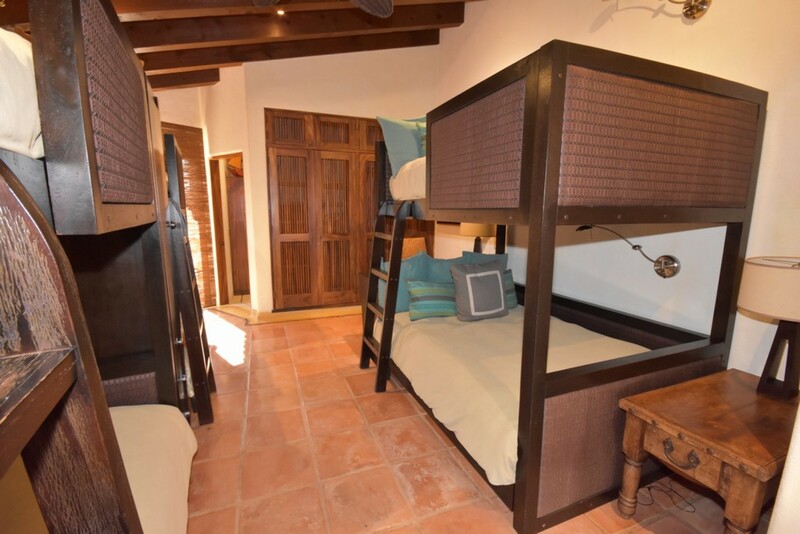 Located on the west side of Mexico, in the Nayarit region, Casa De Casas sits right on the tip of a small peninsula, overlooking Banderas Bay and the Pacific Ocean, and is privy to beautiful sunset views. 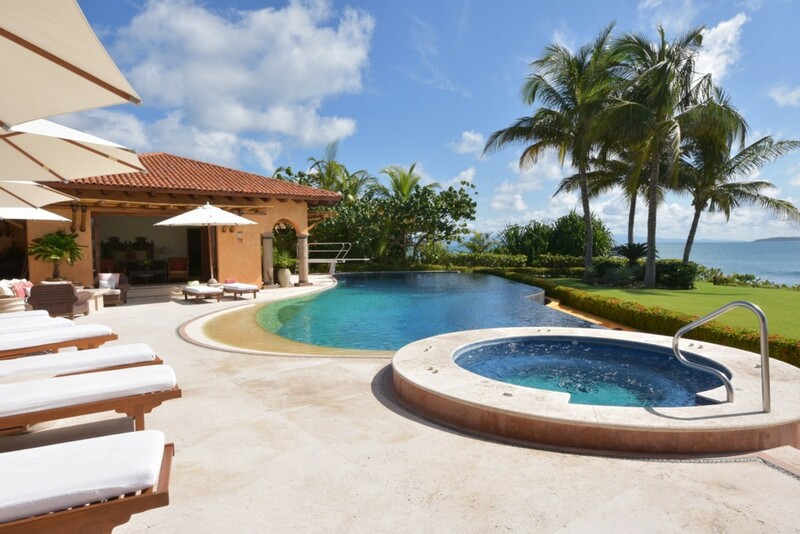 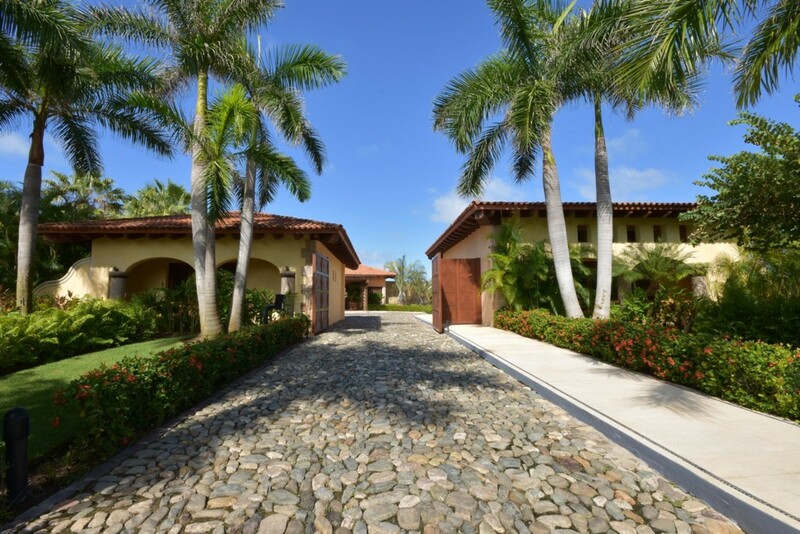 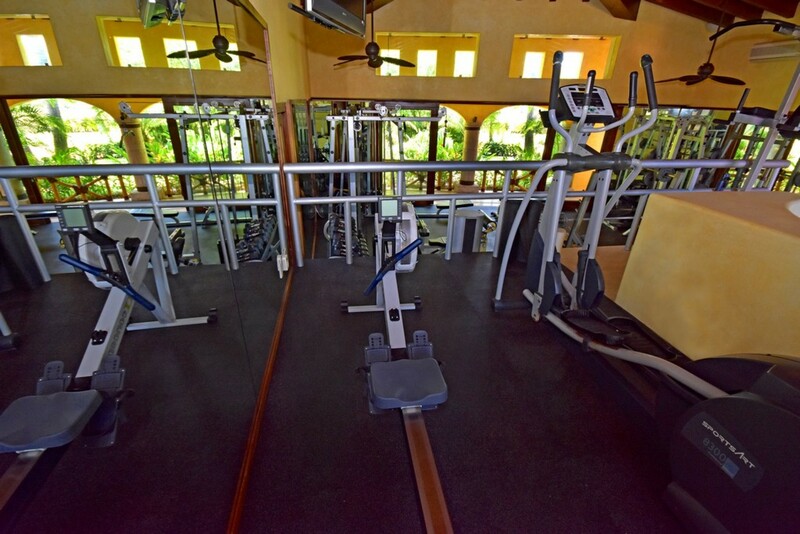 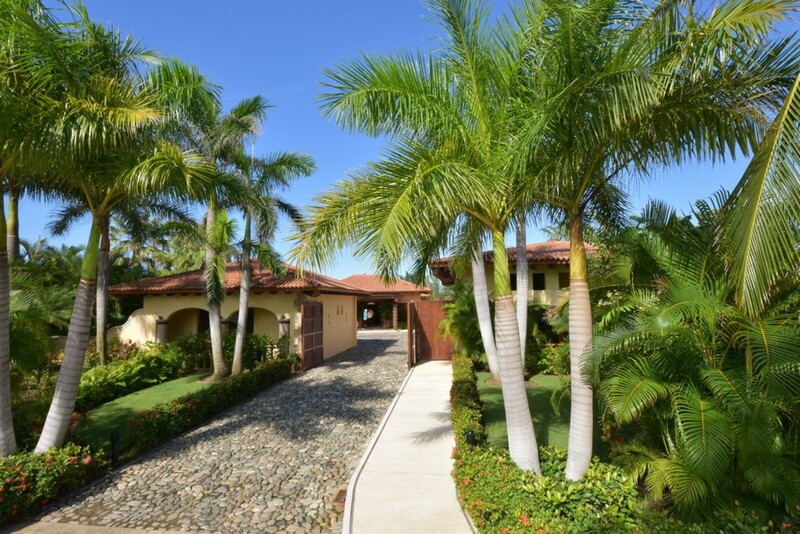 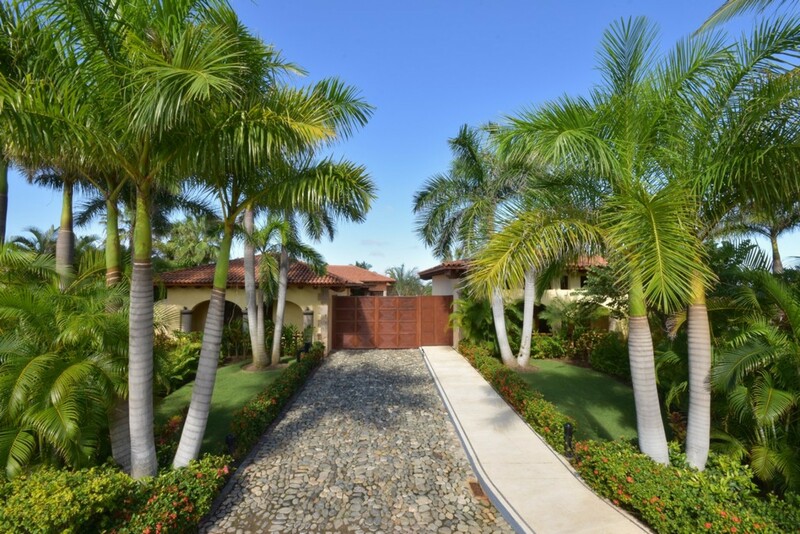 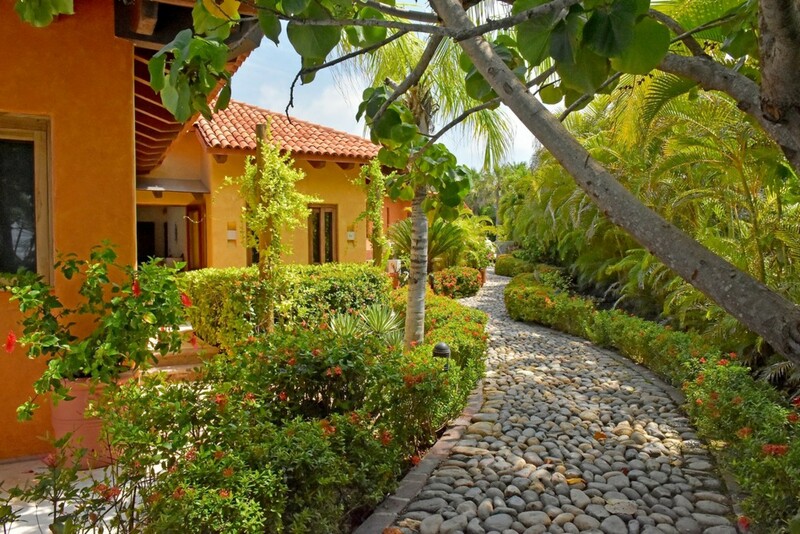 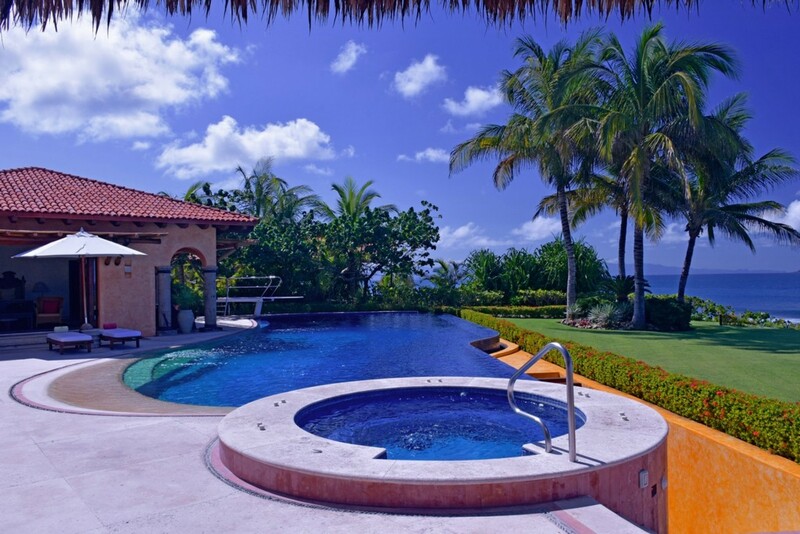 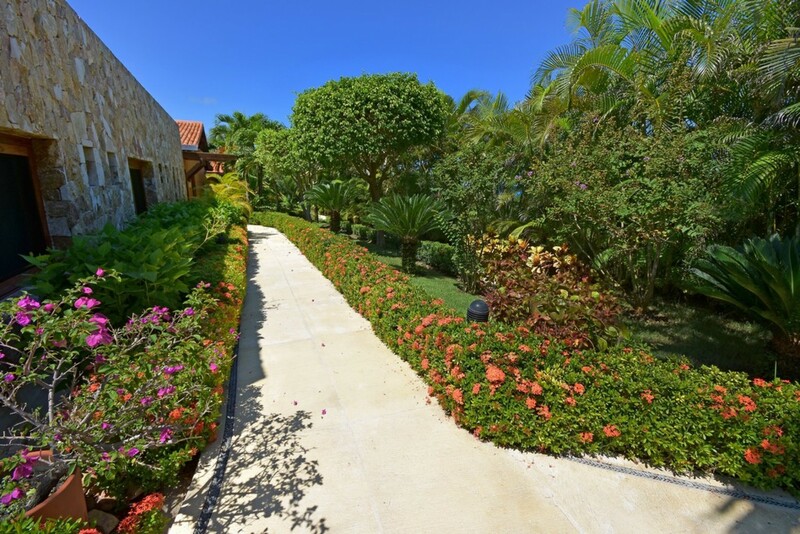 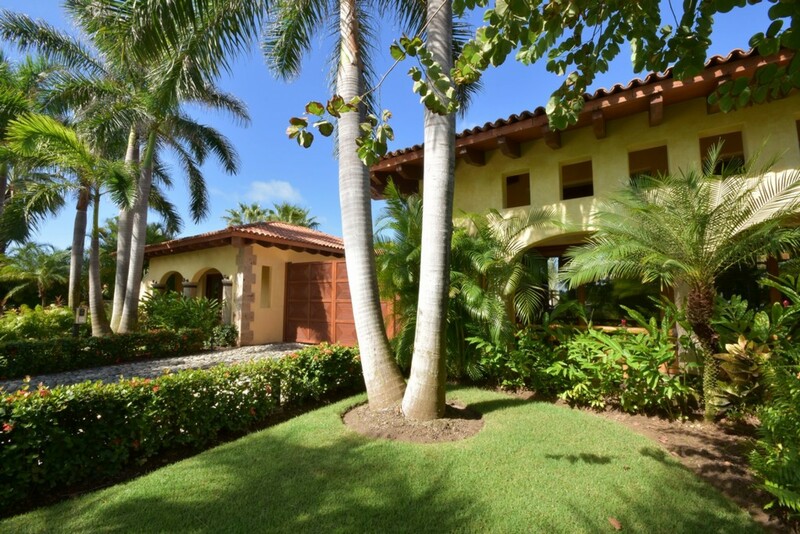 From here, in a secluded gated community of prestigious villas and property, absolute privacy is guaranteed. 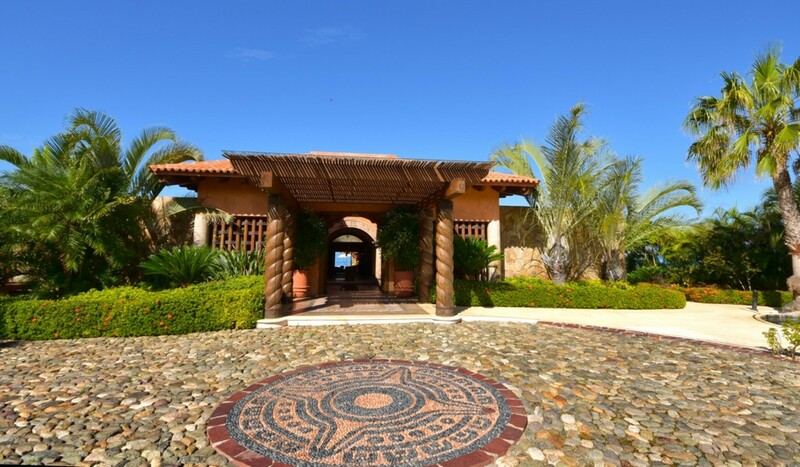 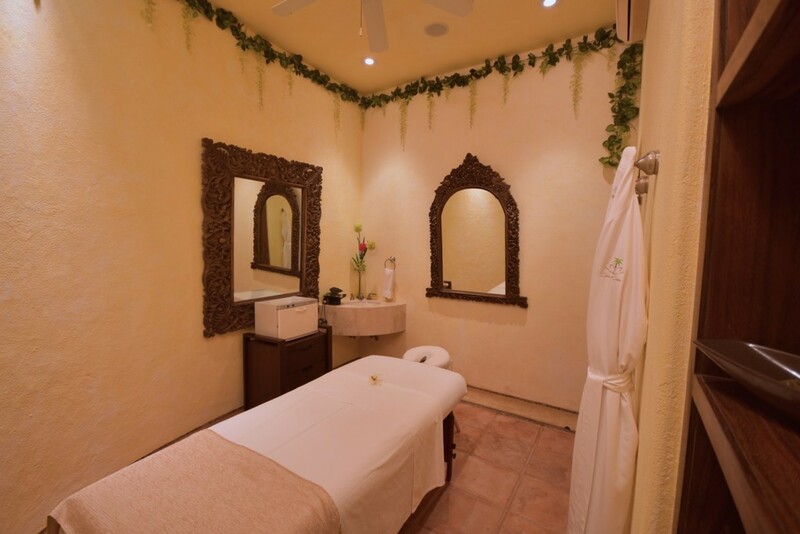 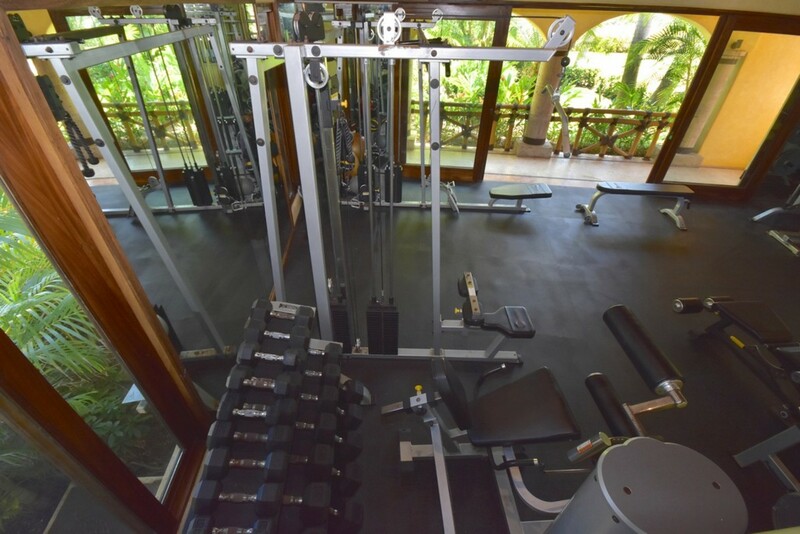 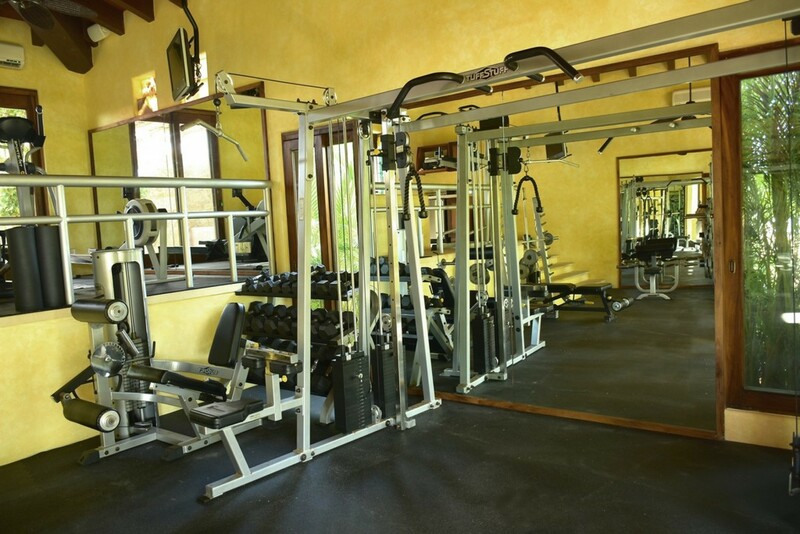 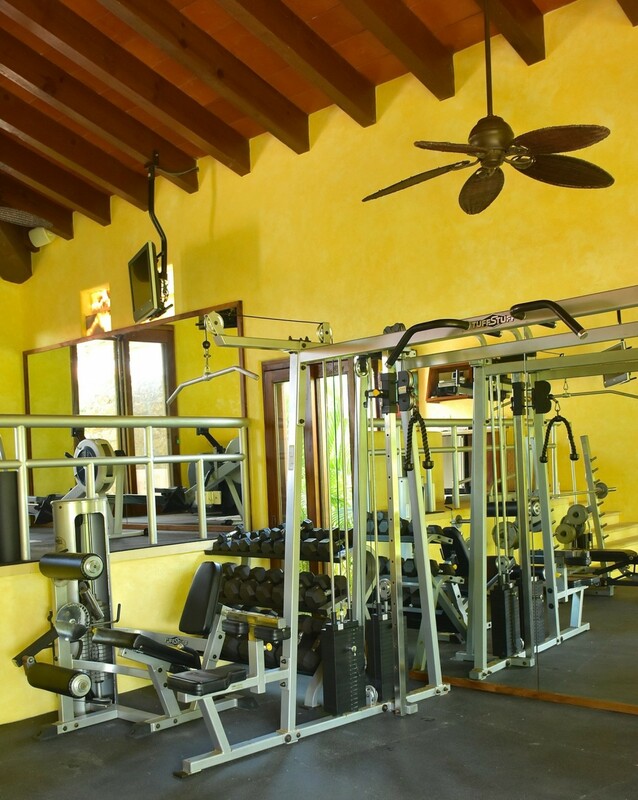 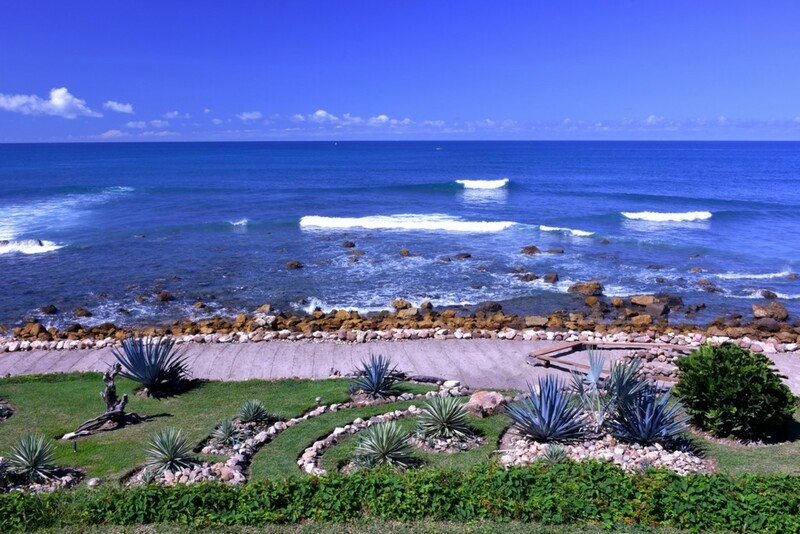 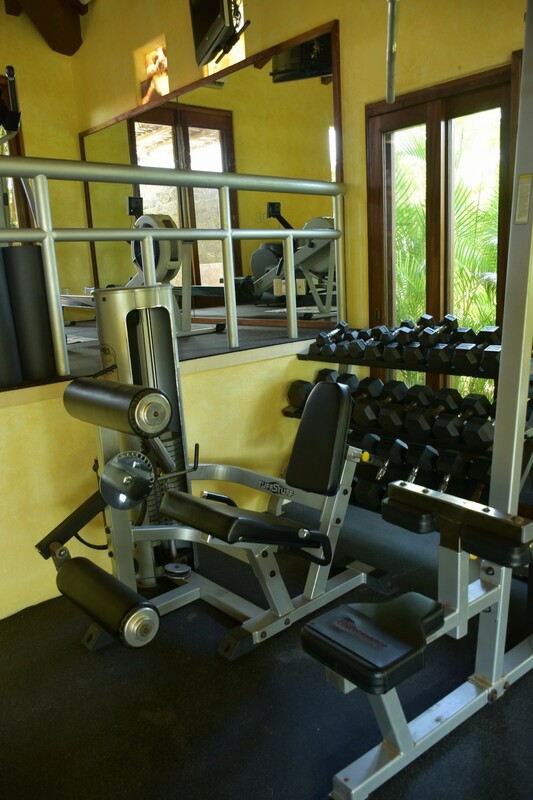 The village of Punta Mita is a short drive from the villa itself (3.5km) and hosts several shops and restaurants for guests to visit and explore. 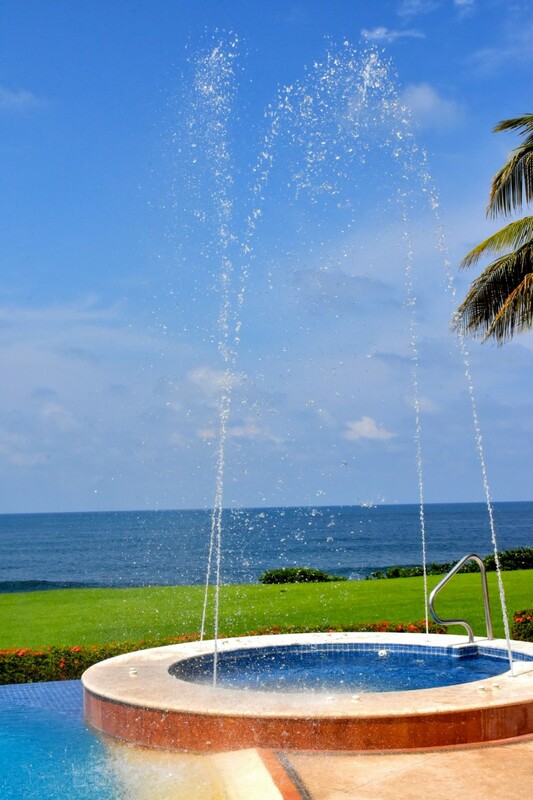 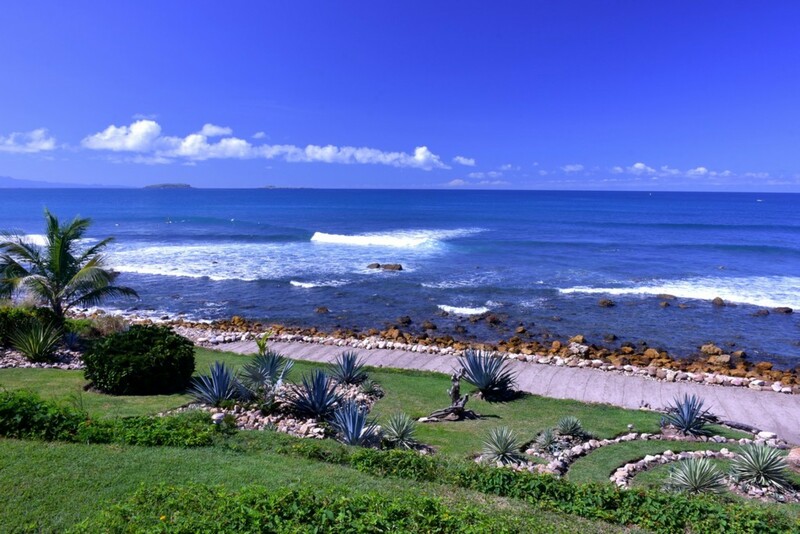 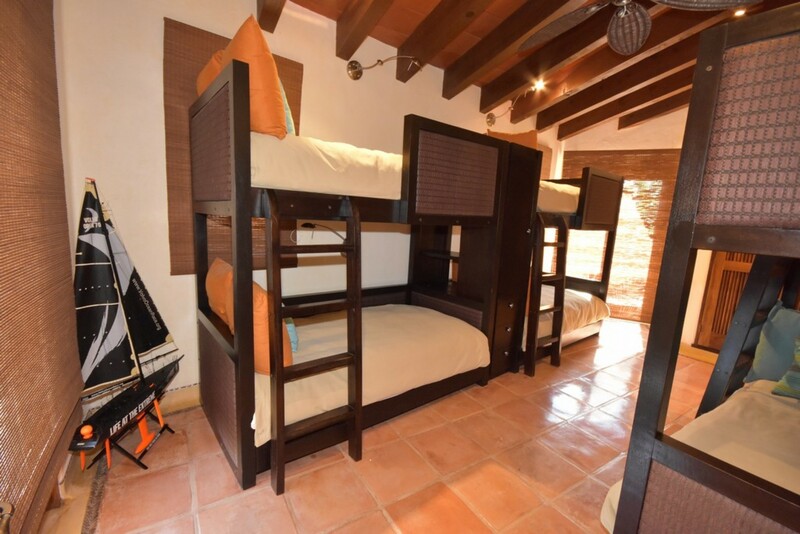 Punta Mita Adventures is a one-stop shop for tours and activities of your choice in the area, offering zip lines, dolphin swims, sailing, snorkeling, scuba diving, flyboarding, surfing, stand up paddle boarding, and much more besides as part of its repertoire of excursions. 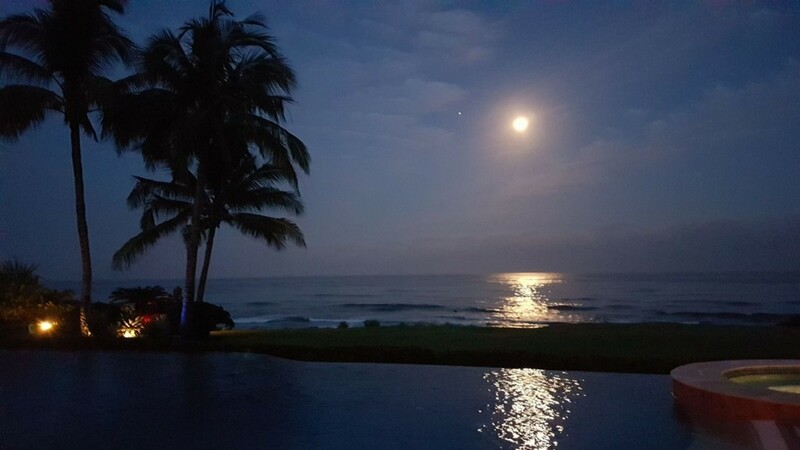 Further down the coast, Puerto Vallarta, a Mexican beach resort city, is an hour’s drive away by car (46.3km), with a healthy night life scene, shopping malls, plenty of beaches and an interesting history.